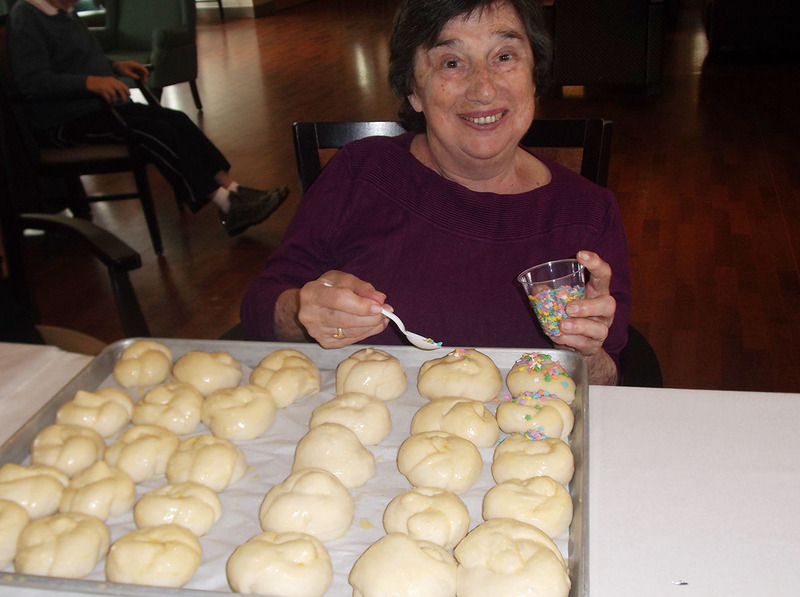 Decorating cookies we baked for Rosh Chodesh Adar (the celebration of the start of the Jewish month of Adar)! 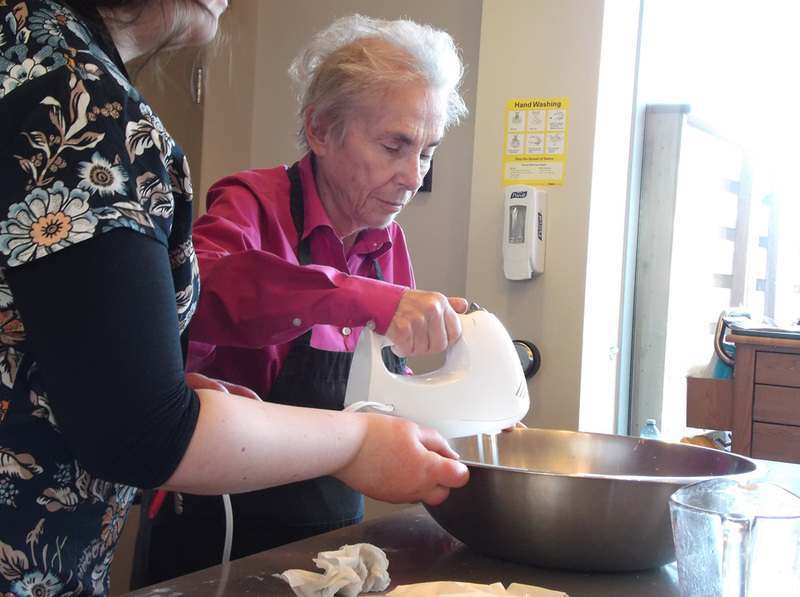 Making Mandelbread cookies during our baking program. 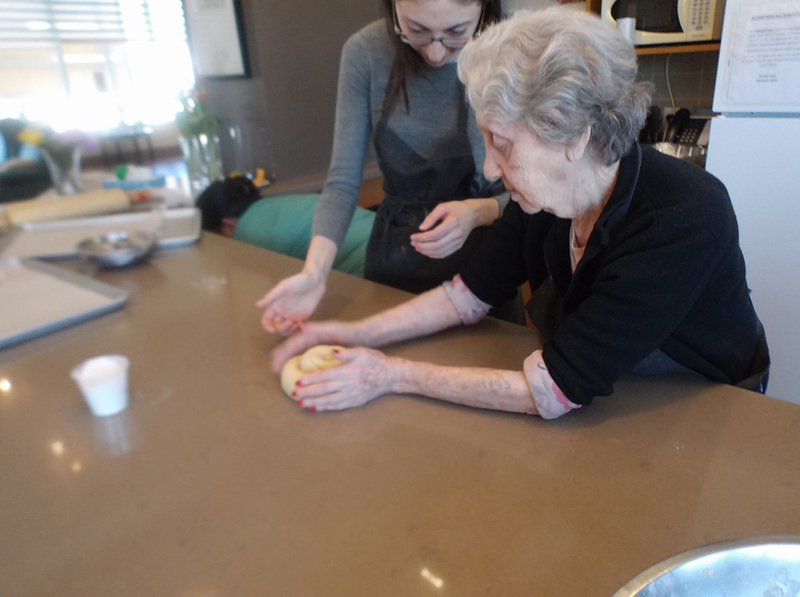 Working Hard To Roll Out The Dough For Our Famous Cinnamon Buns. 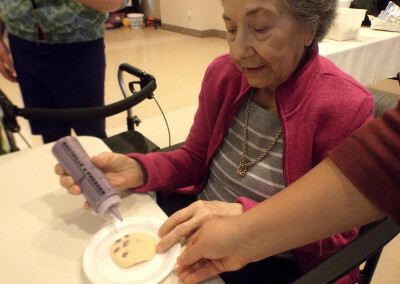 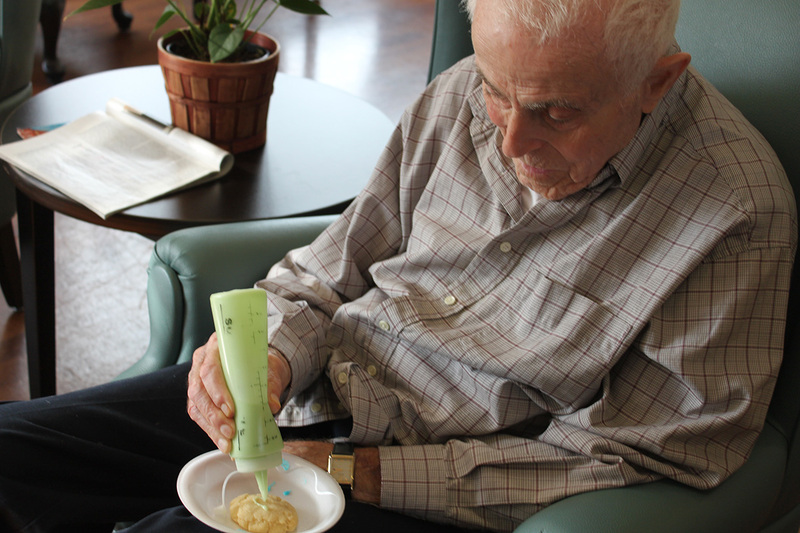 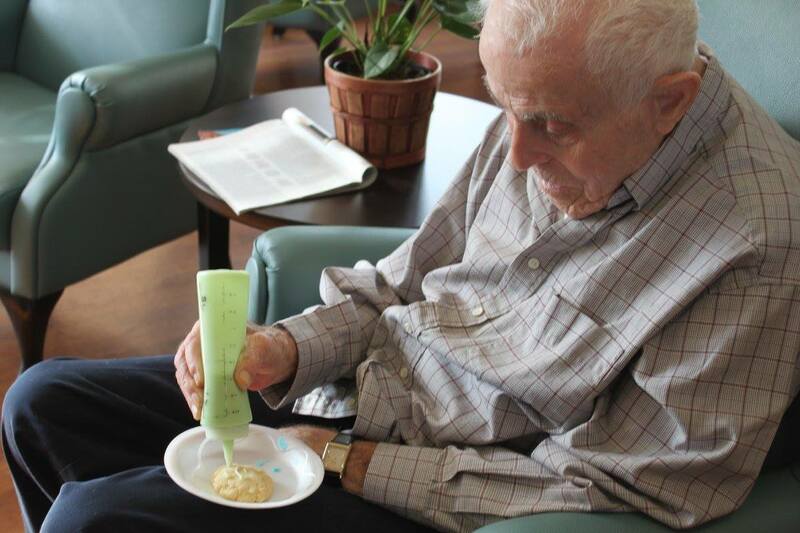 Baking sugar cookies with our residents. 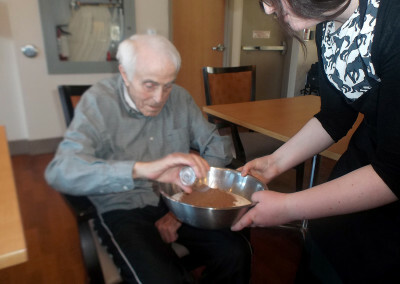 Lending a helping hand with baking a delicious chocolate cake. Shaping beautiful challahs to be baked for Shabbat. 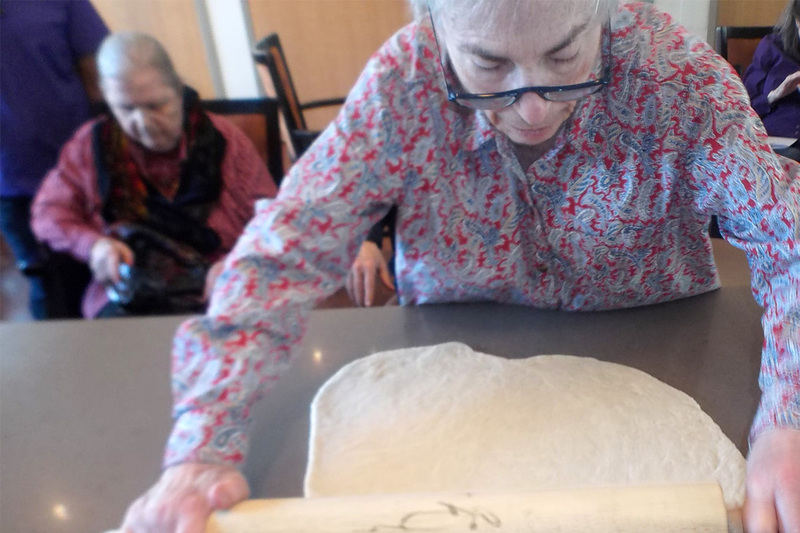 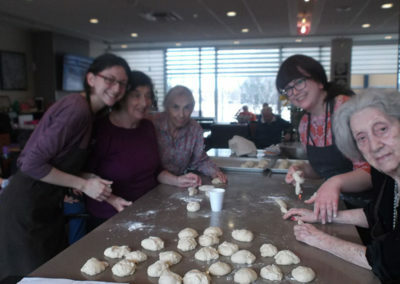 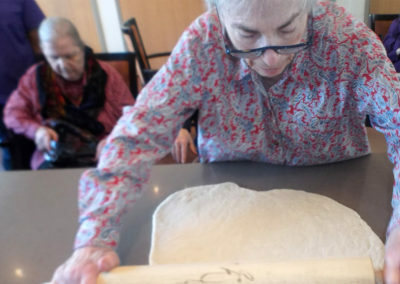 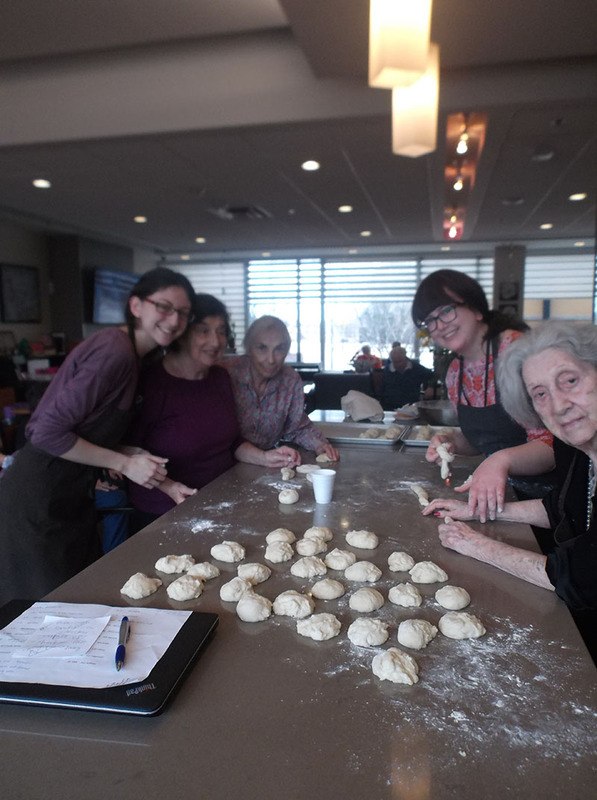 Smiling for the camera during our weekly challah baking program. 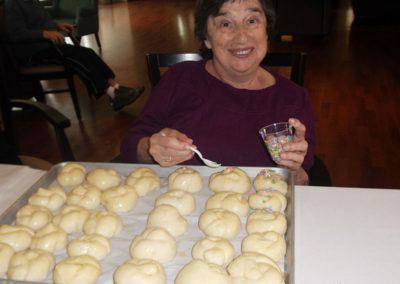 Helping to decorate challah buns with sprinkles. 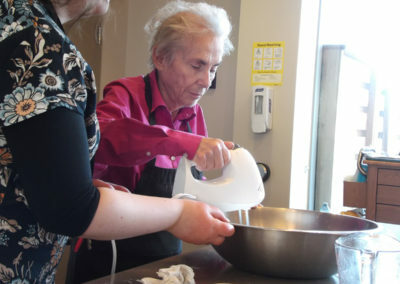 Using hand blender to prepare delicious baked goods! 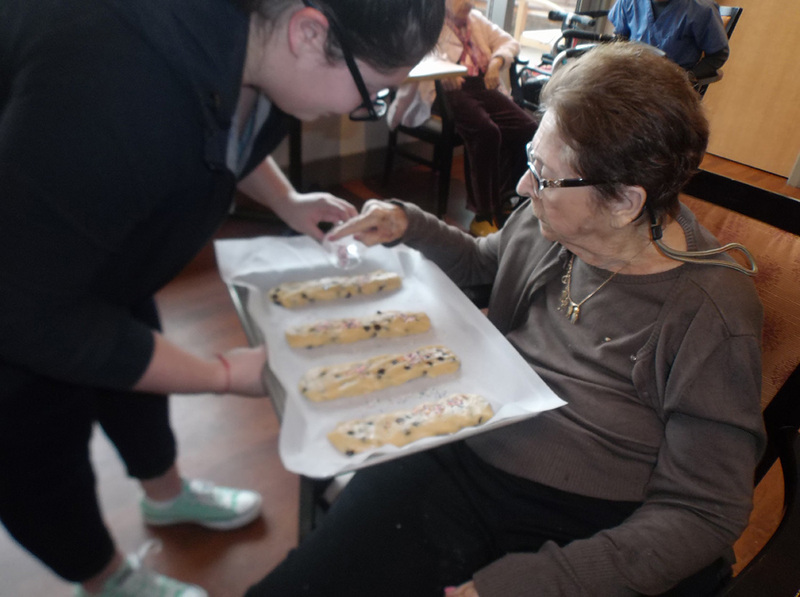 Personalizing cookies into a work of art with icing. 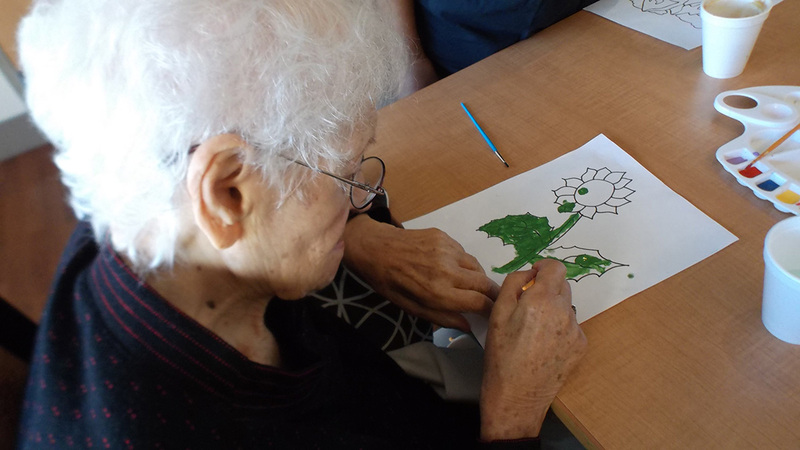 Focusing so intently drawing with a Spirograph set. 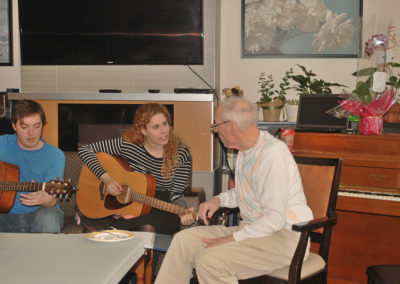 Young adults from D.A.N.I. 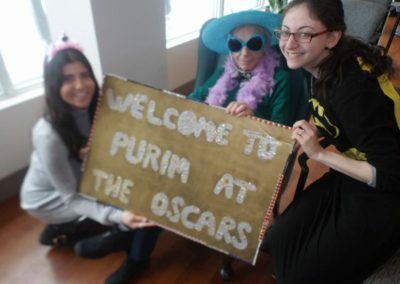 helped us with our Purim decorations! 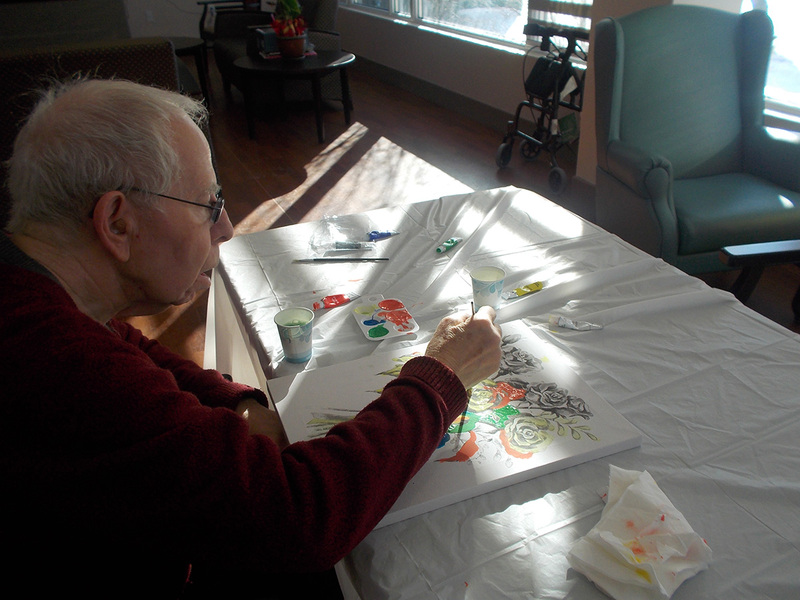 We Have Quite The Artist On Our Premises! 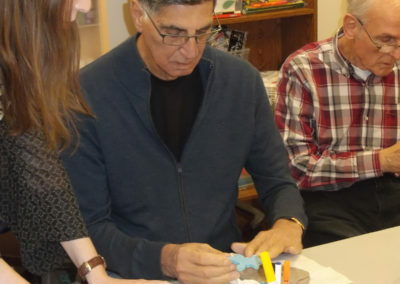 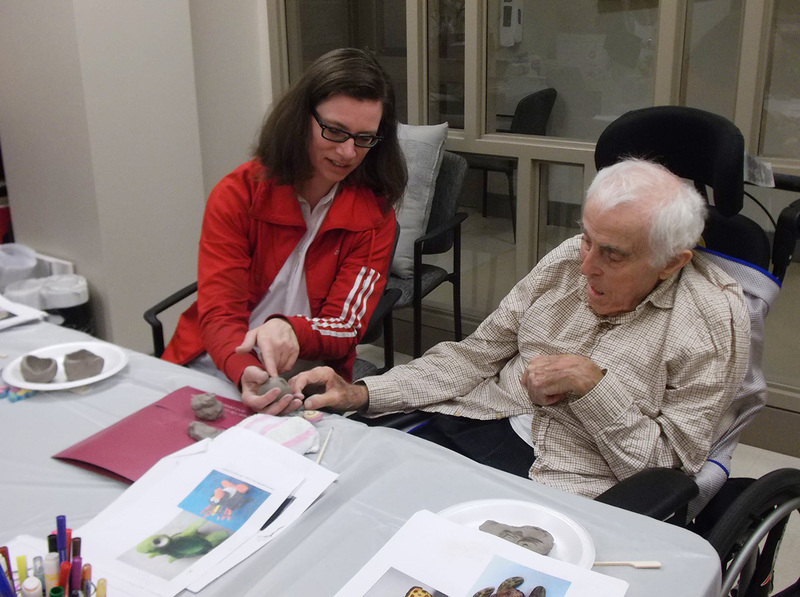 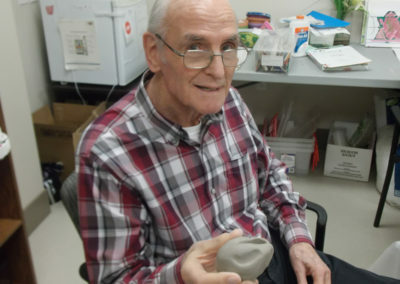 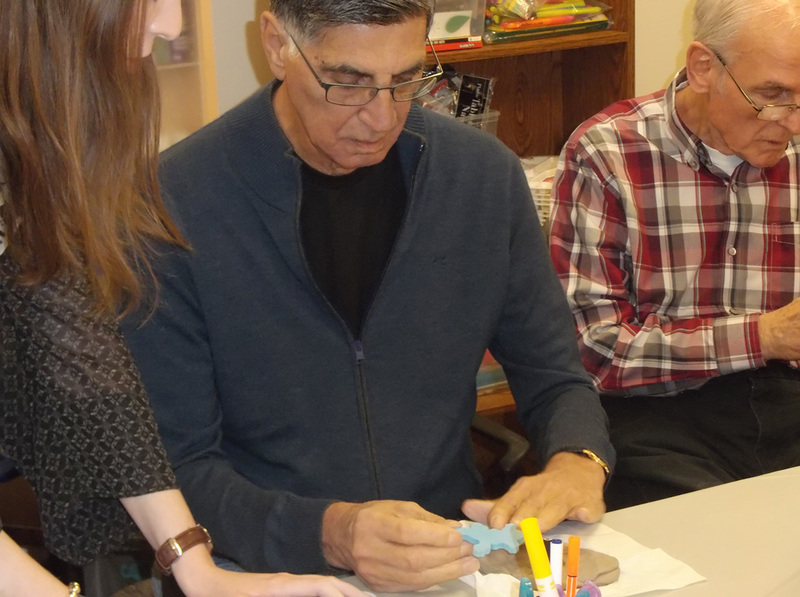 Enjoying making clay figures with our Art Therapist Kim Abramowitz! 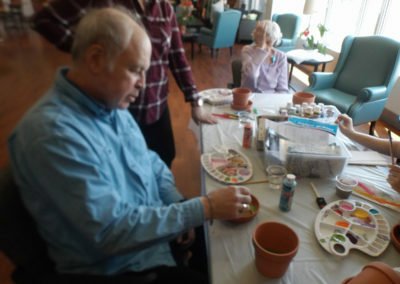 Painting flowerpots for our vegetable garden. 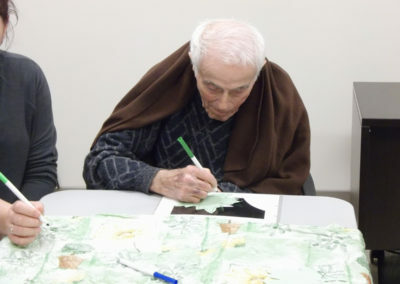 Decorating leaves for our Tu B’Shvat (Jewish New Year of the Trees) Art Project. 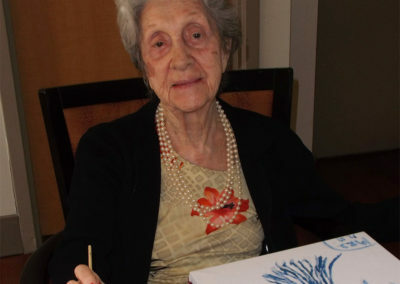 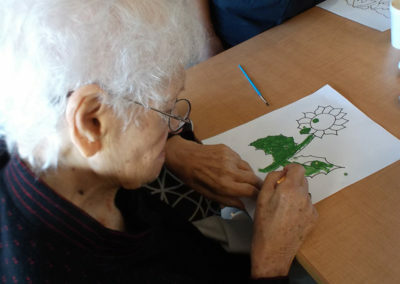 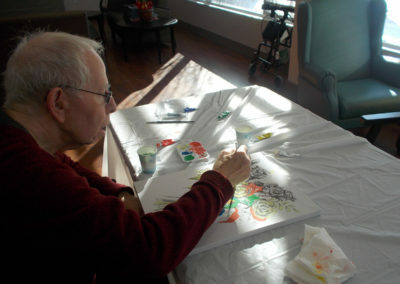 Painting a flower for springtime. 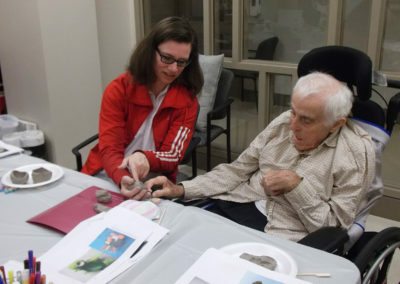 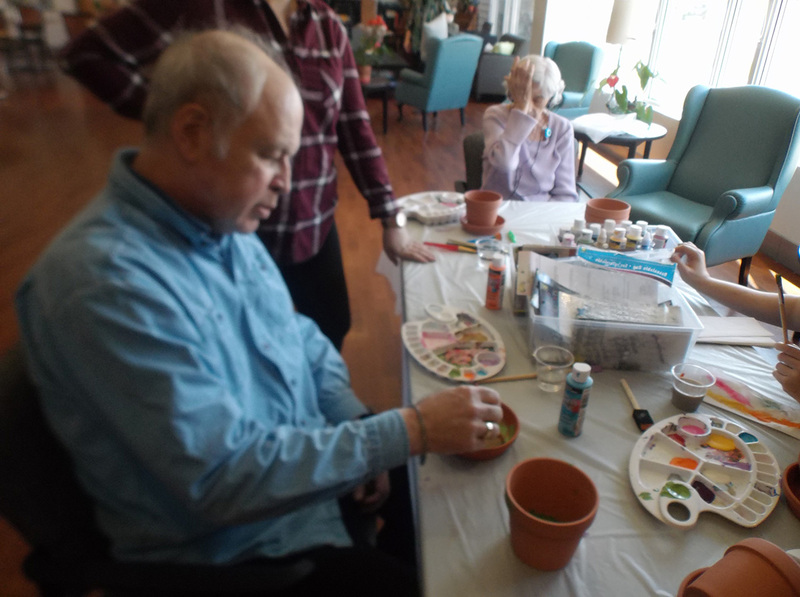 Enjoying Making Clay Impressions during Art Therapy With Kim Abramowitz! 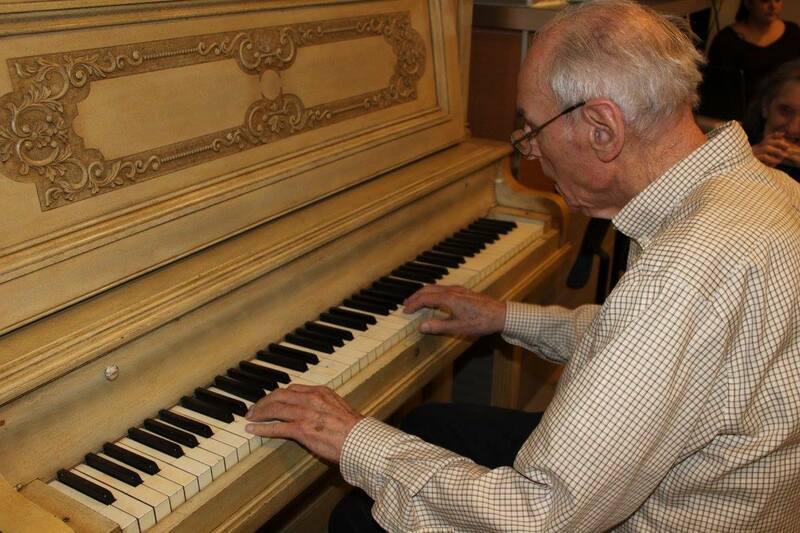 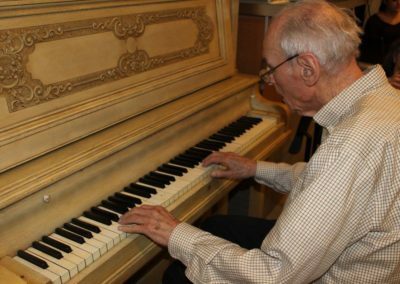 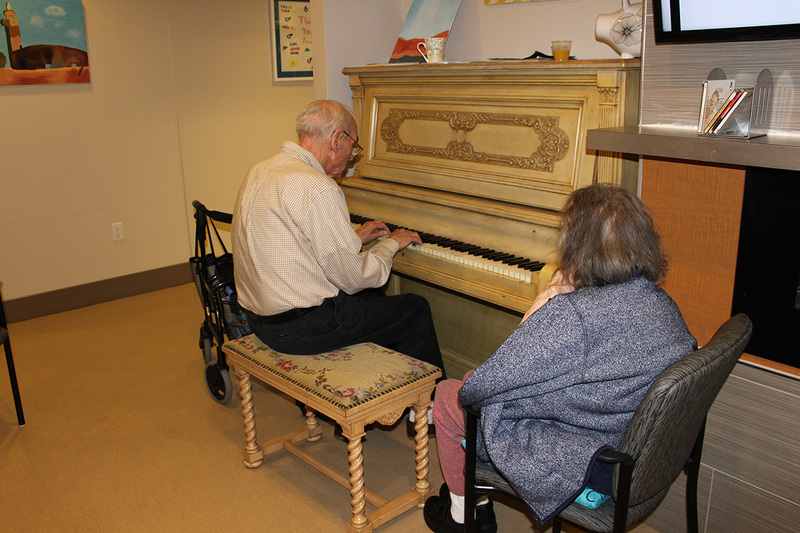 Having a singalong wouldn’t be complete without our resident piano player! 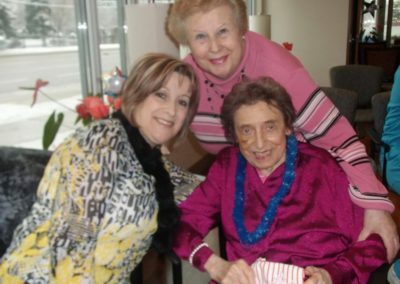 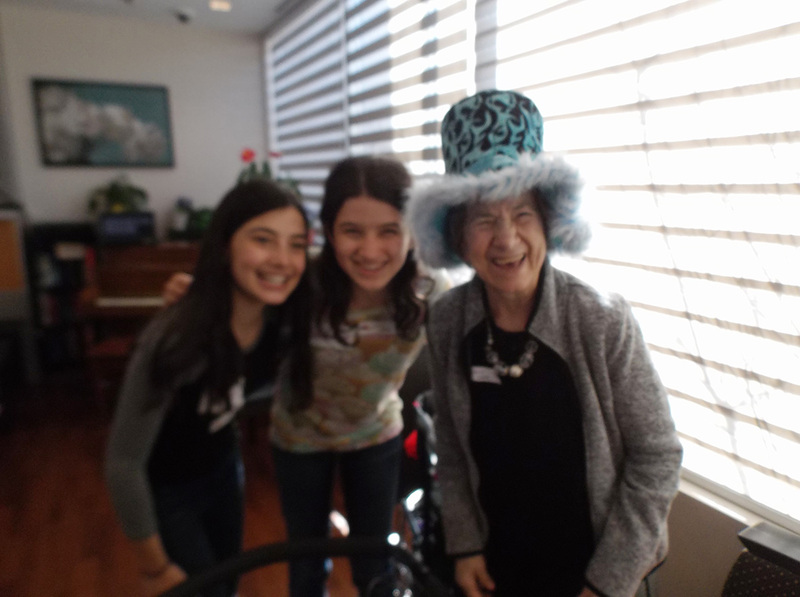 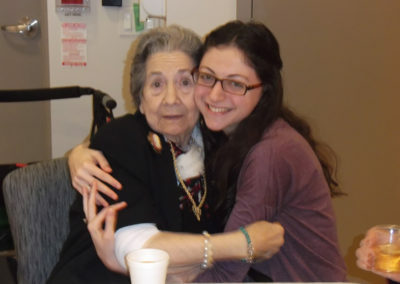 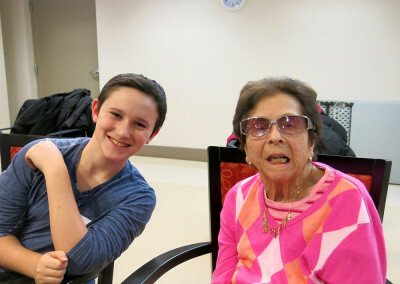 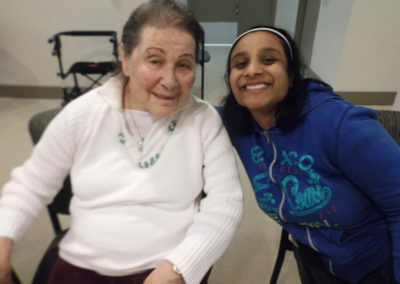 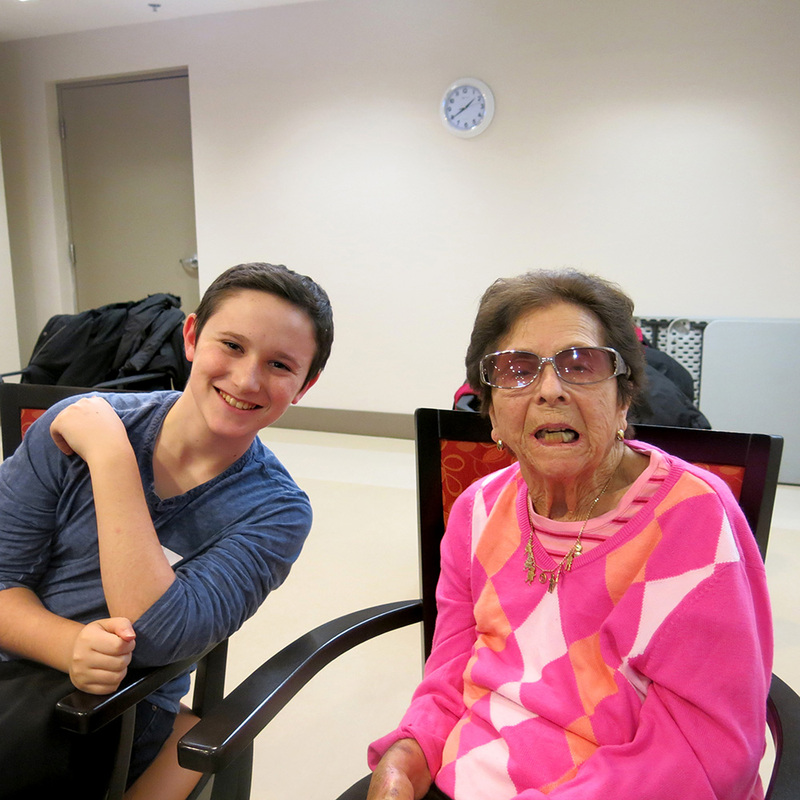 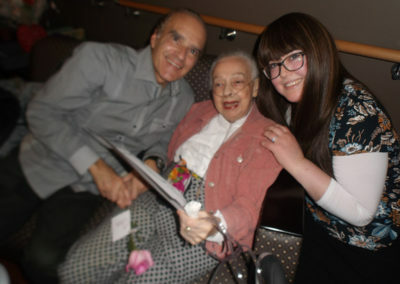 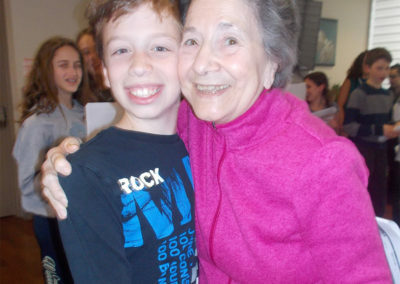 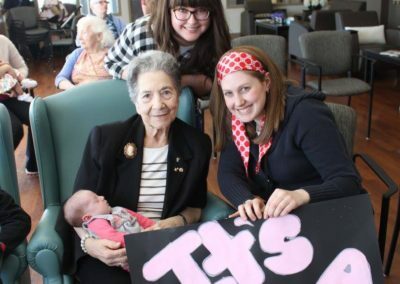 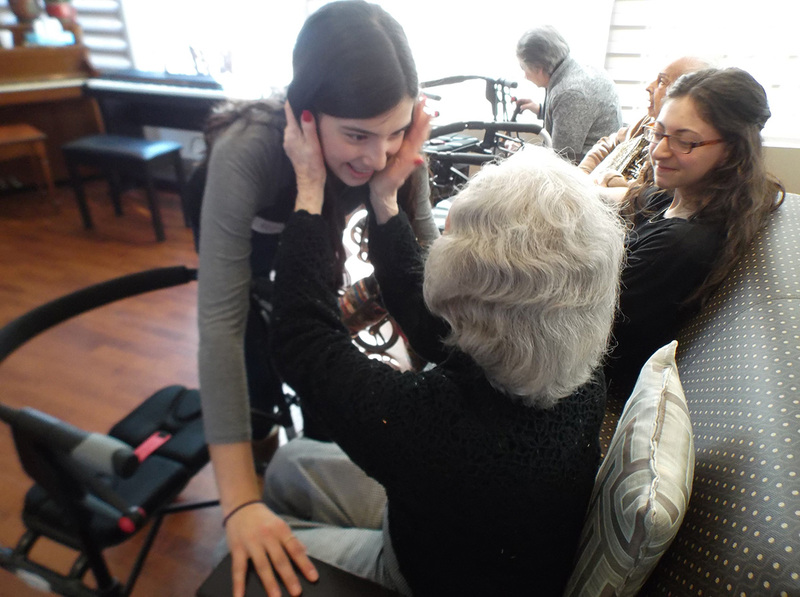 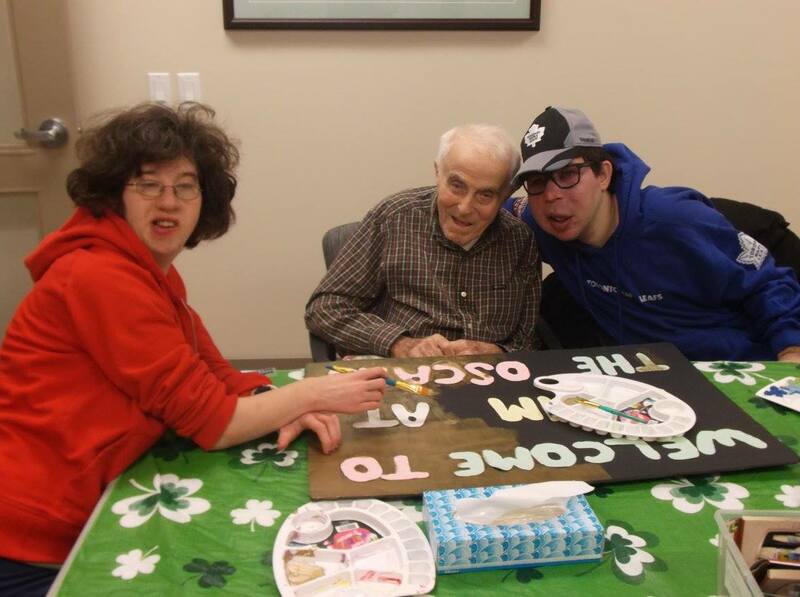 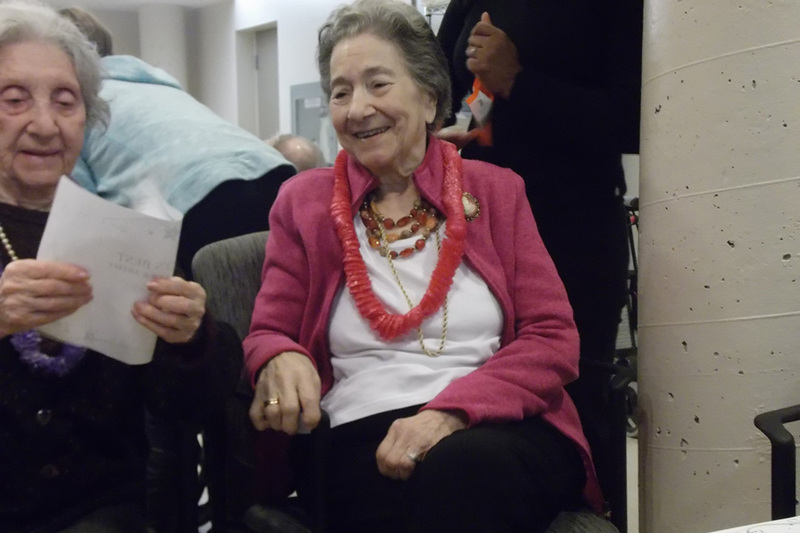 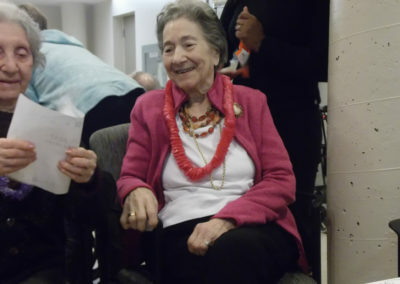 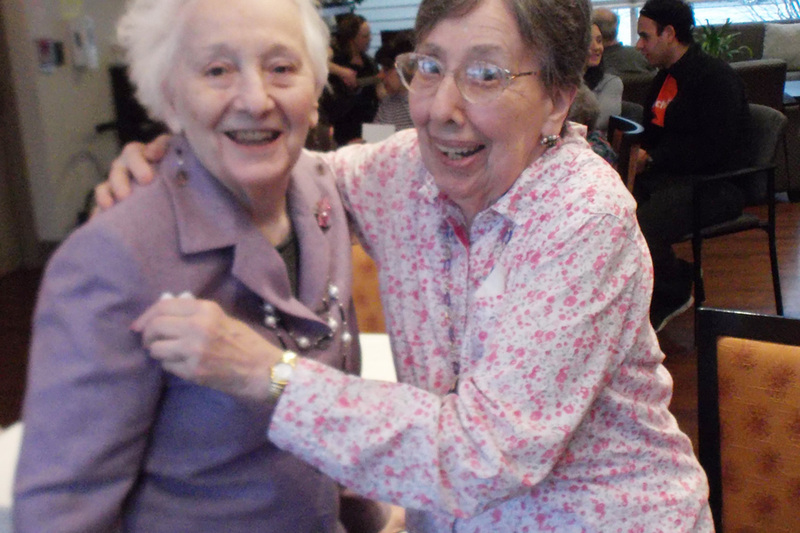 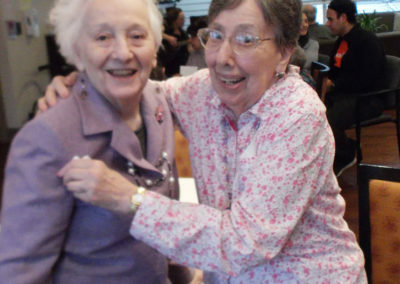 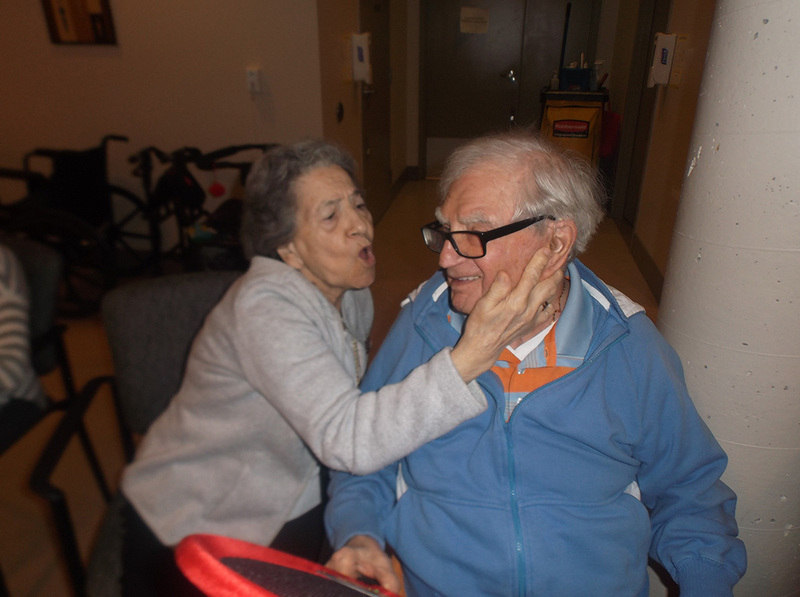 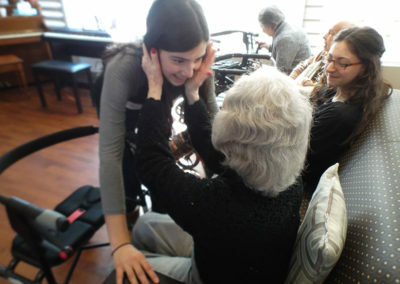 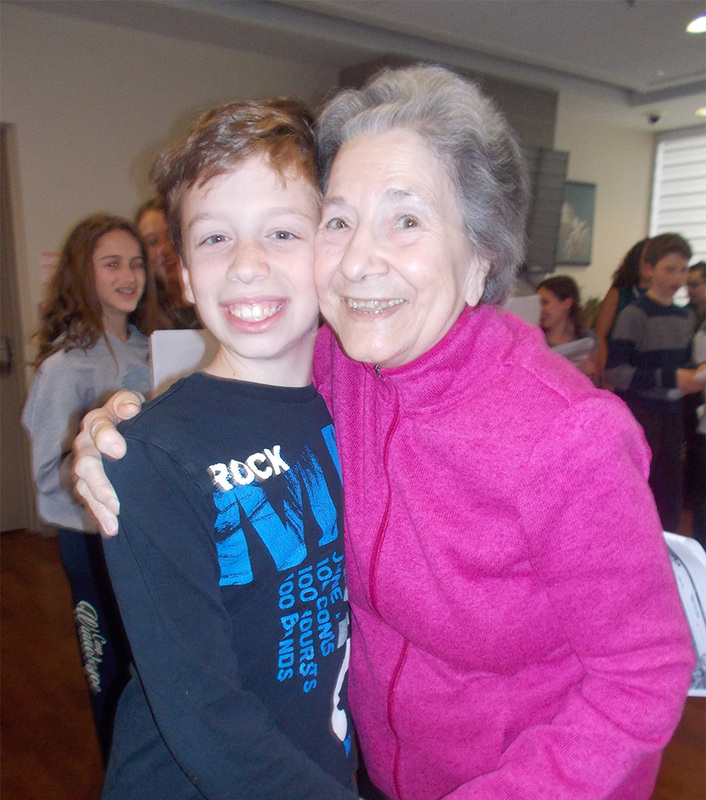 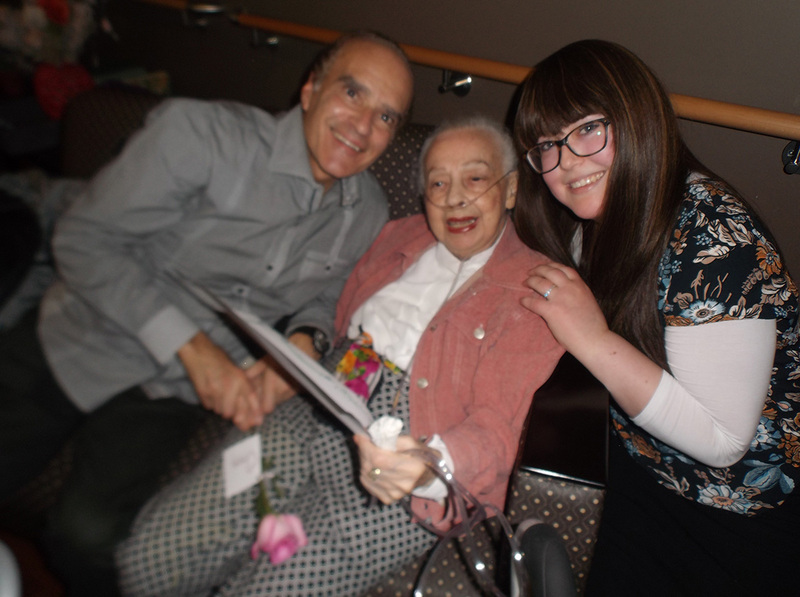 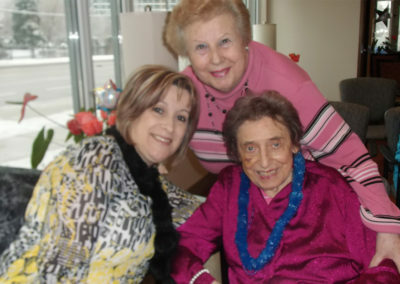 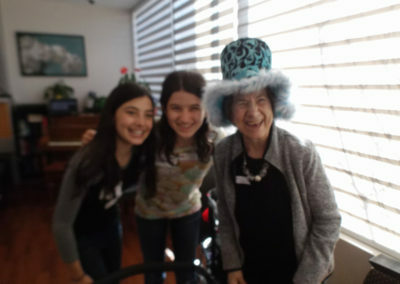 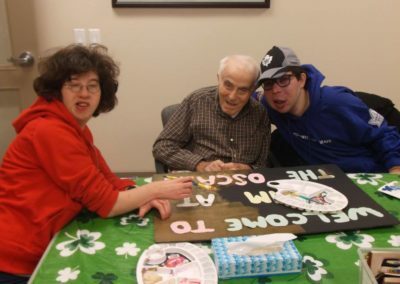 One Of Our Residents Posing With A Student From Leo Baeck’s Glee Club That Performed For Us On Feb 3rd. 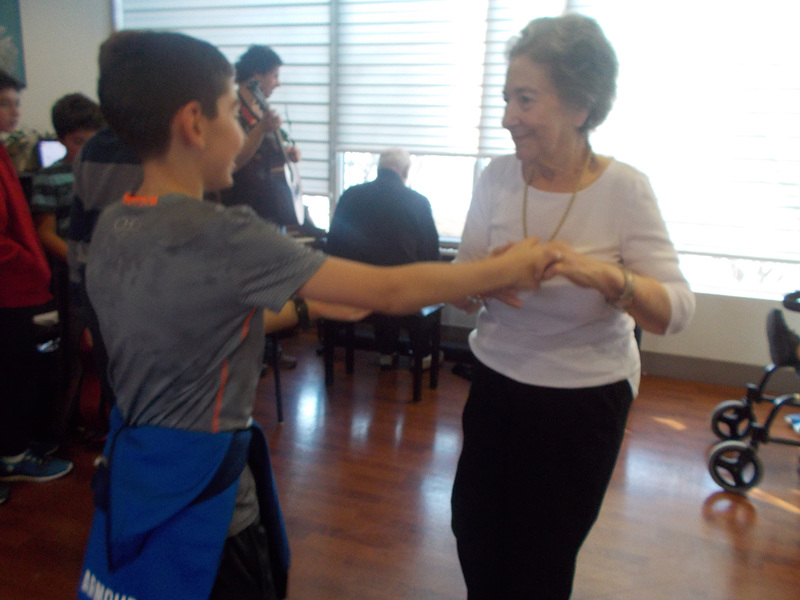 Dancing up a storm with a student from Leo Baeck’s Glee Club. 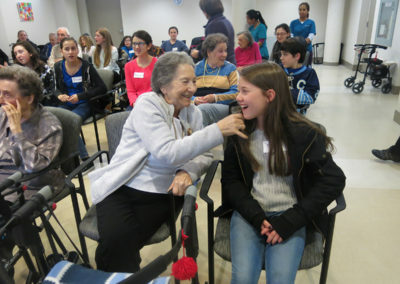 Smiling students from Associated Hebrew Schools who joined us for a singalong on January 29th. 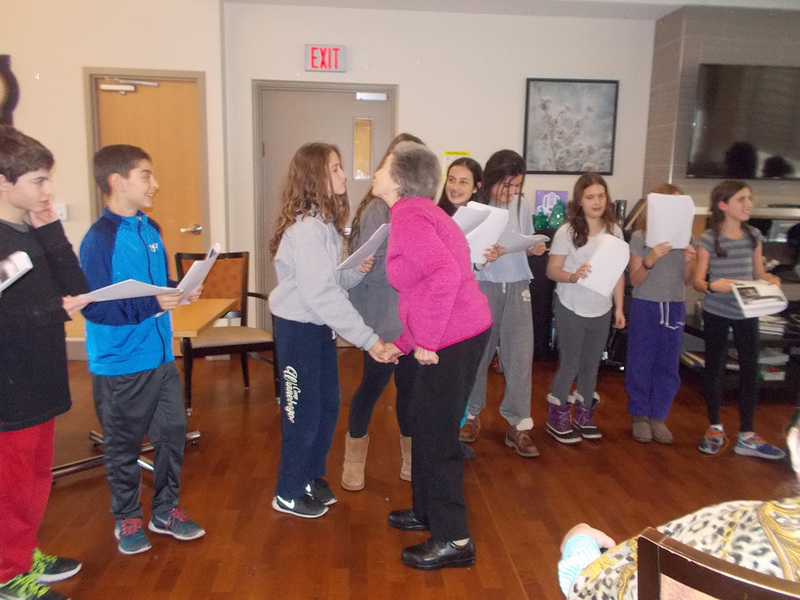 Greeting the Leo Baeck South Students during their performance. 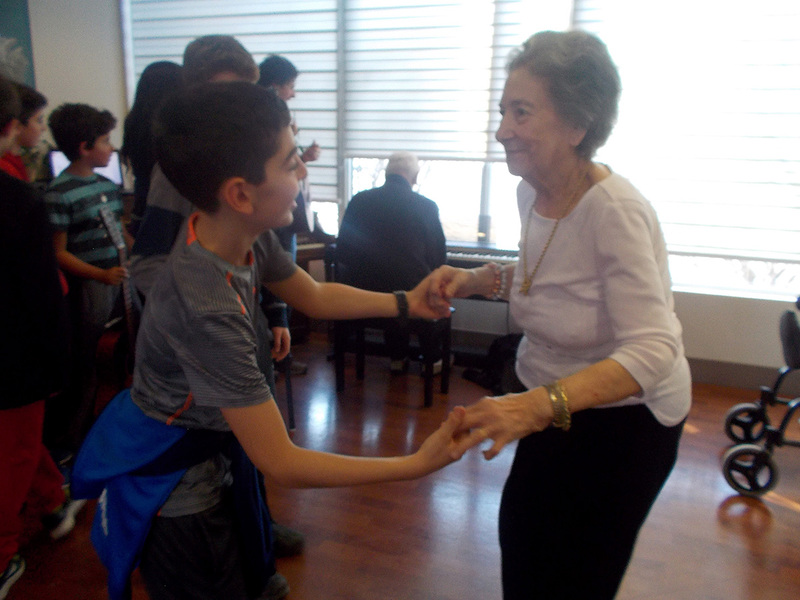 Dancing with the Leo Baeck South Students during their performance. 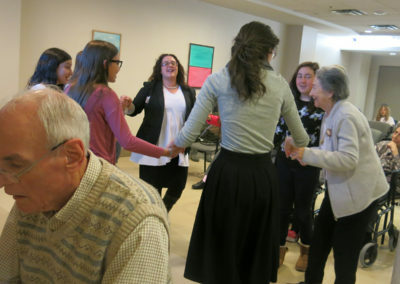 Having a fun time with the students from Associated Hebrew Schools of Toronto who came with silly hats in tow for a Rosh Chodesh Adar (New Hebrew Month) Singalong. 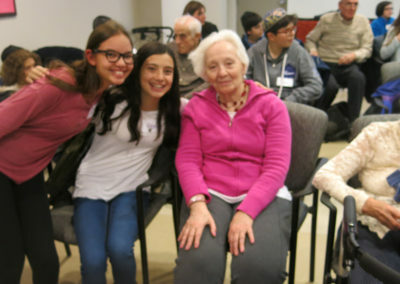 A beautiful moment with one of the students from the Associated Hebrew Schools of Toronto during the Rosh Chodesh Adar (New Hebrew Month) Singalong. 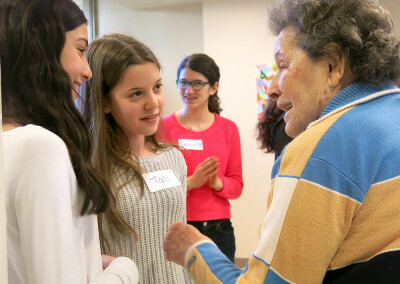 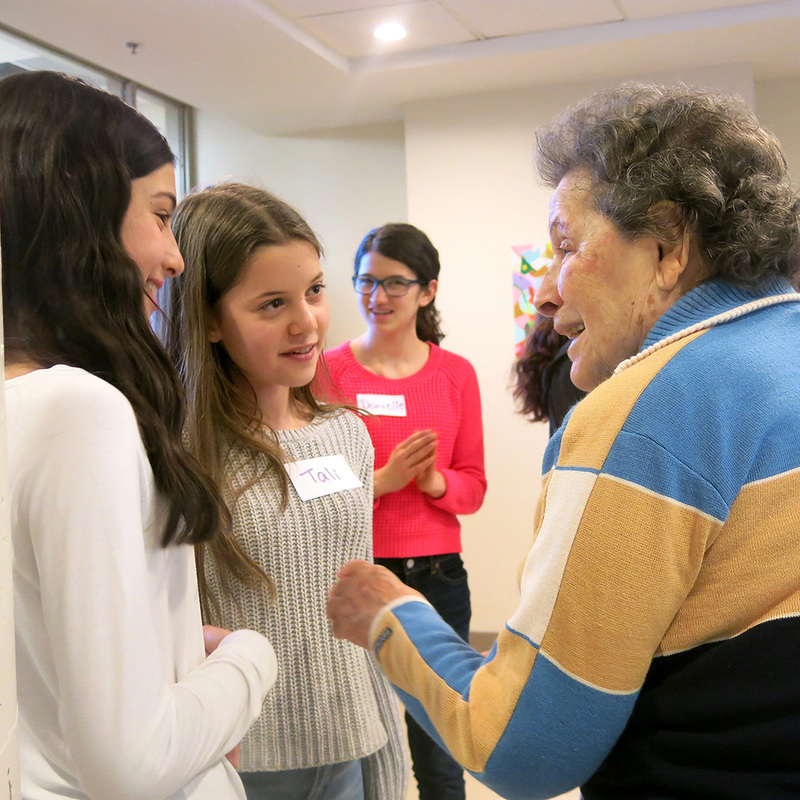 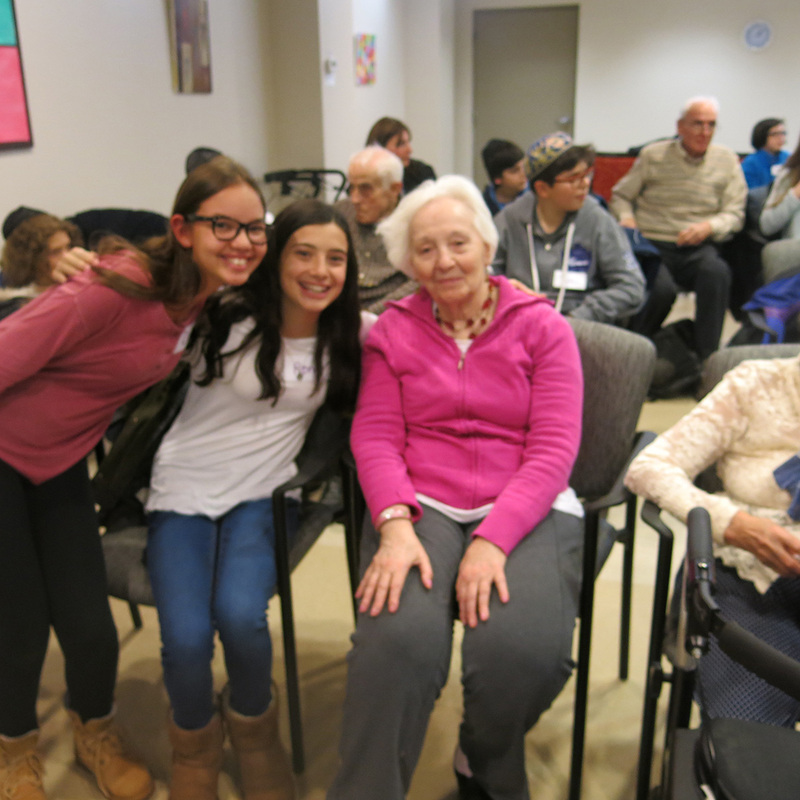 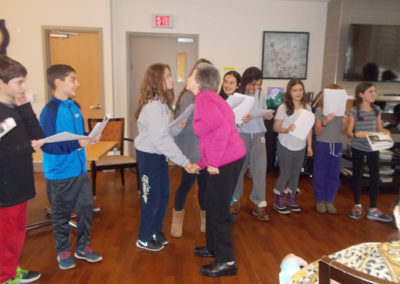 Smiling for the camera with students from Associated Hebrew Schools of Toronto who came for a singalong with our residents. 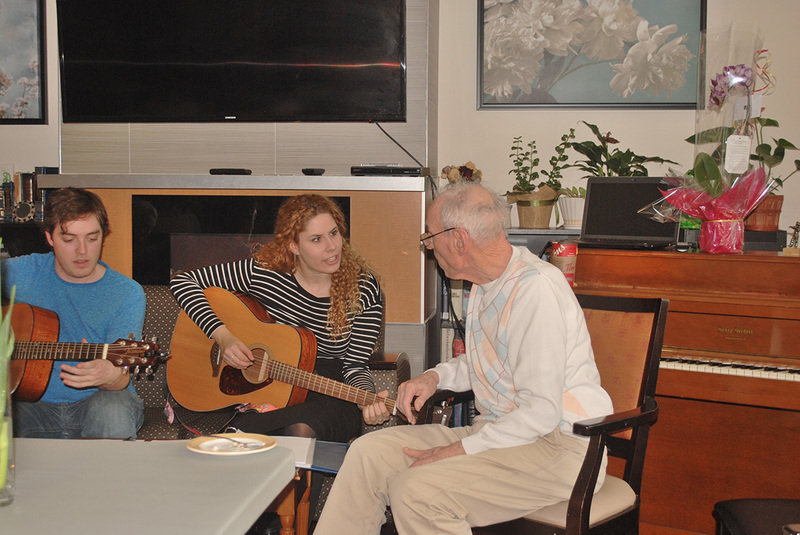 Spending time with Associated students during the singalong. 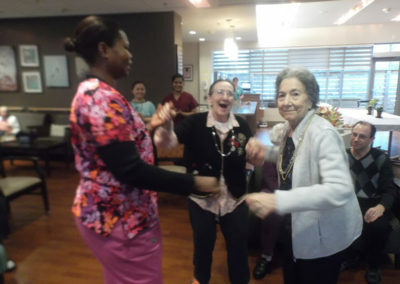 Dancing the ‘hora’ during the singalong with Associated. 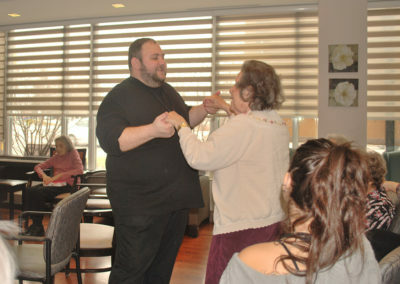 Circle dancing during a musical performance. 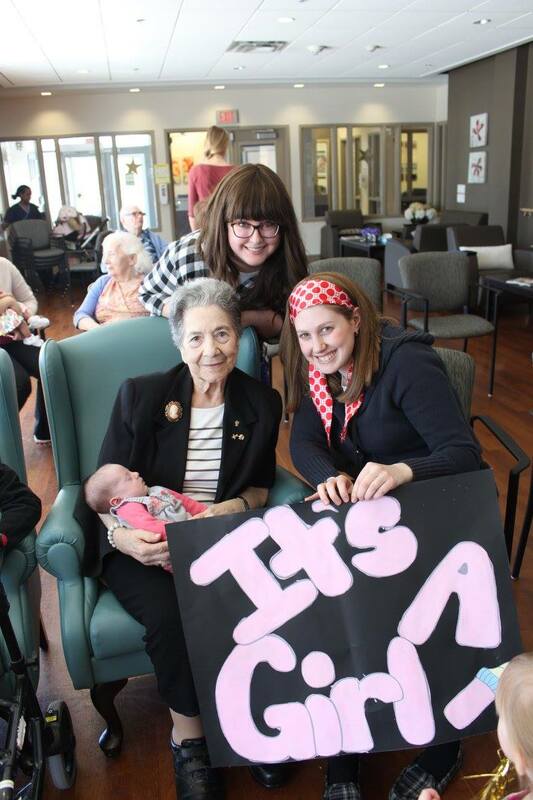 Posing for the camera with Rena and her new baby at a baby shower we held for Ethel and Rena, who both had baby girls! 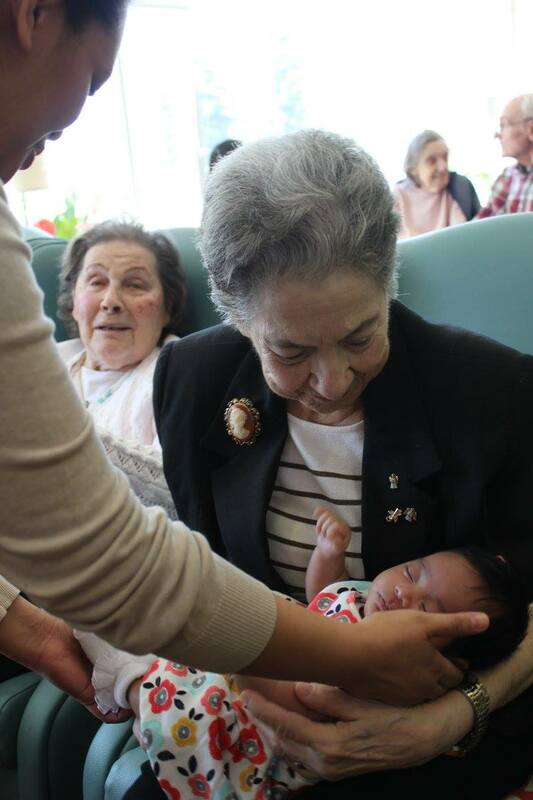 Posing for the camera with Ethel’s baby. 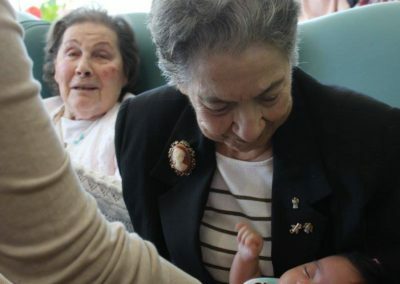 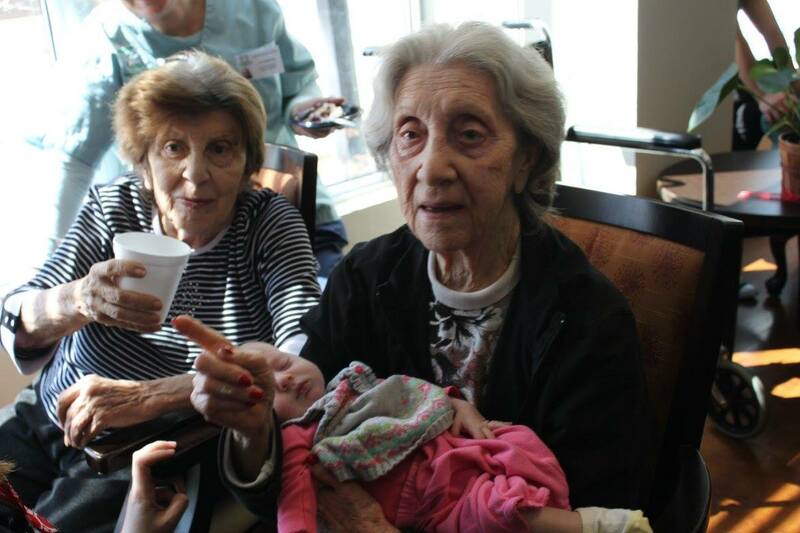 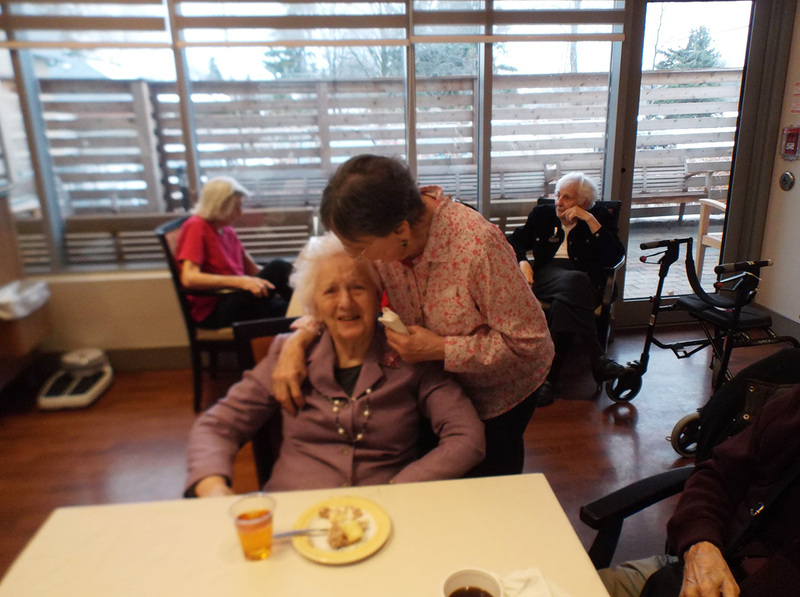 Residents enjoying the baby shower. 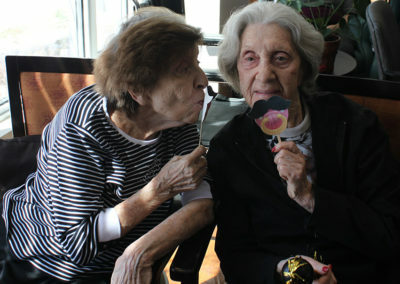 Enjoying our baby shower themed photo shoot! 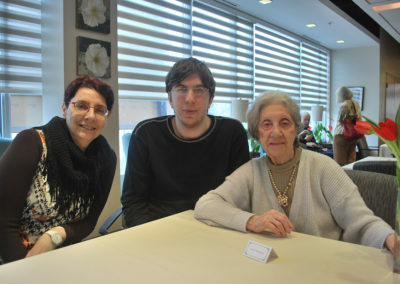 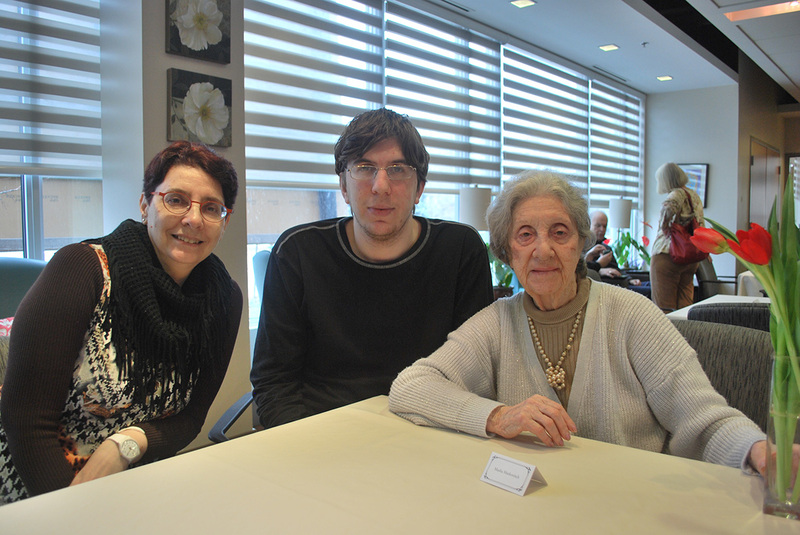 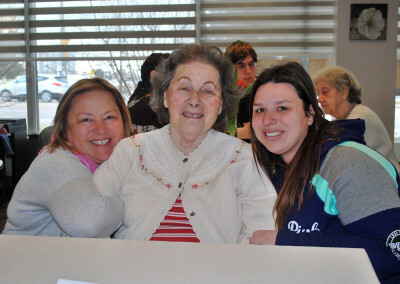 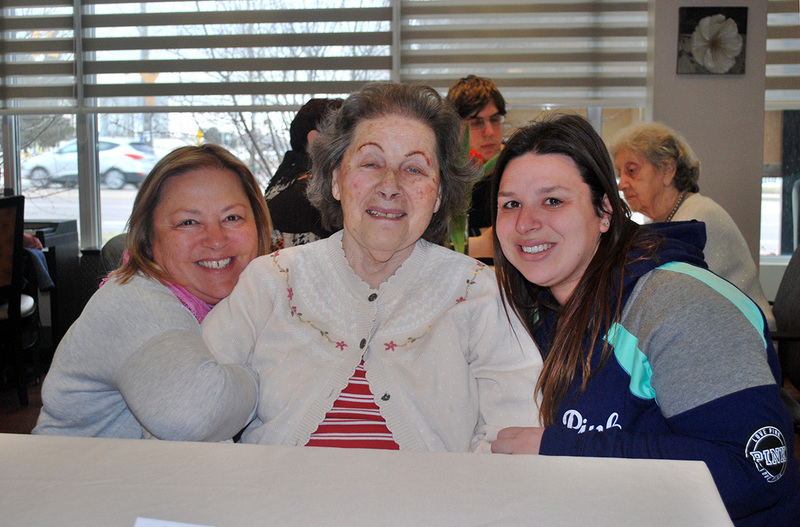 One of our residents and her family at our Family & Friends Brunch. 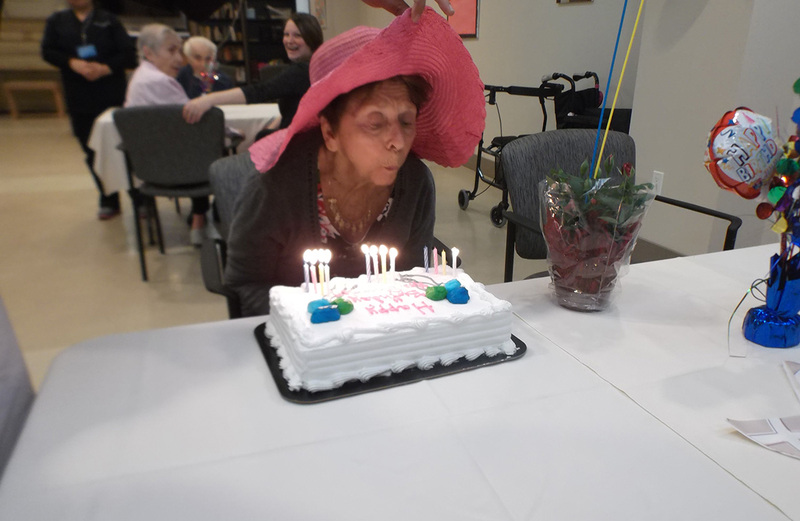 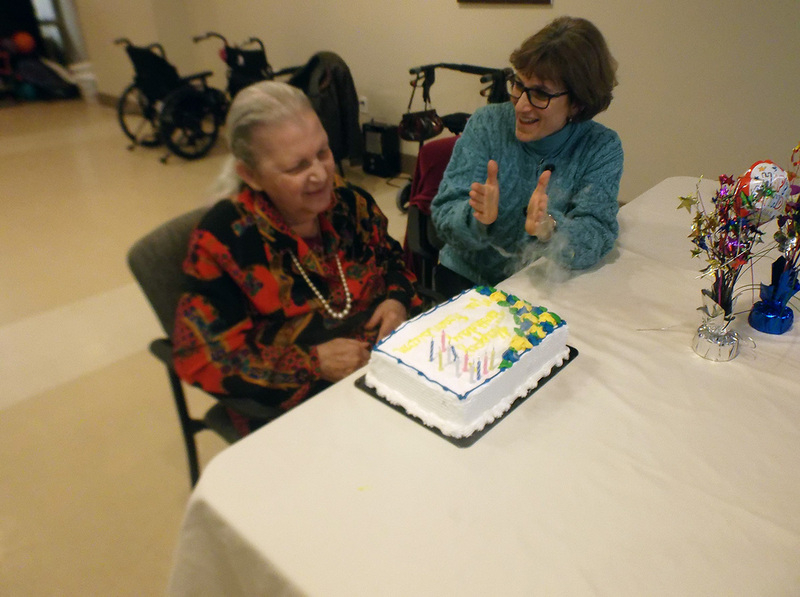 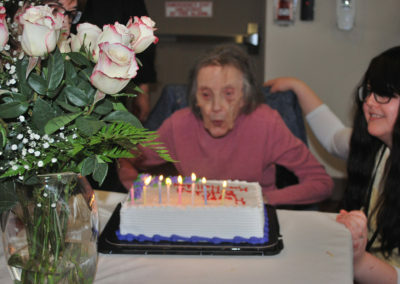 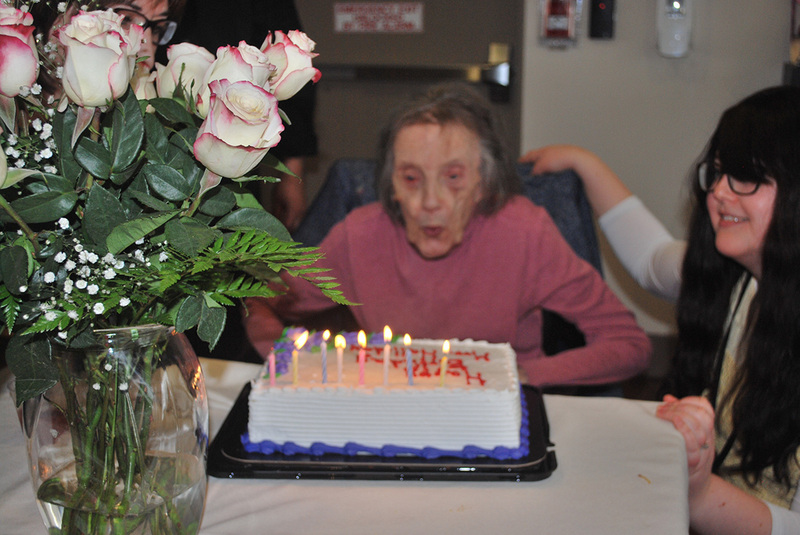 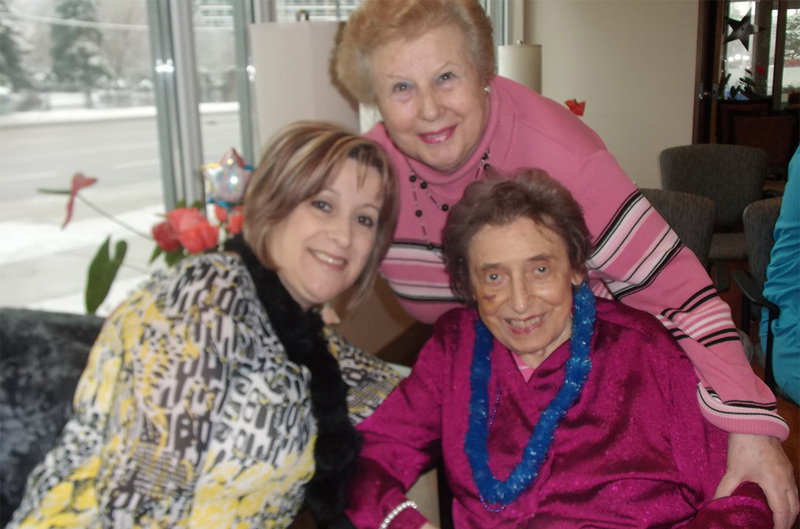 Every birthday is a cause for celebration at One Kenton Place! 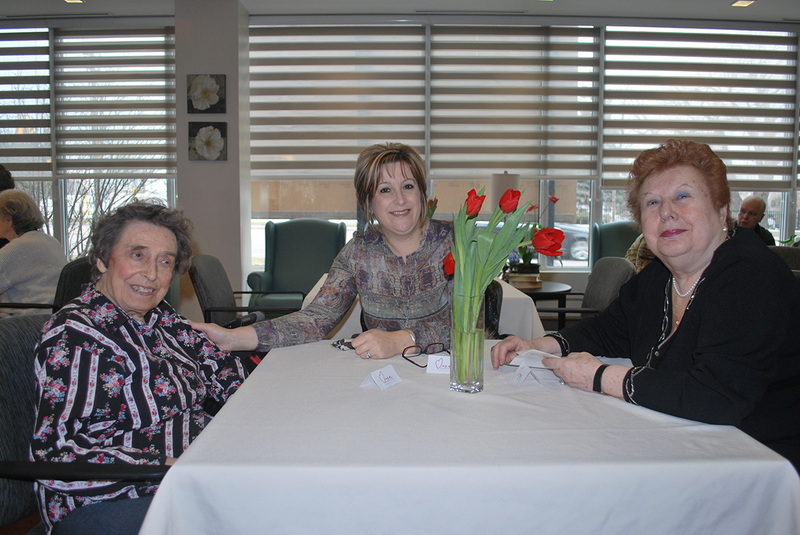 Our residents and their families enjoyed our beautiful Mother’s Day Tea with our special awards & roses ceremony. 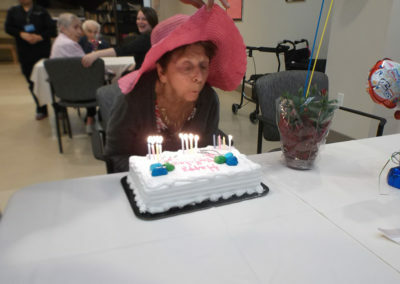 Blowing out the candles at a birthday celebration! 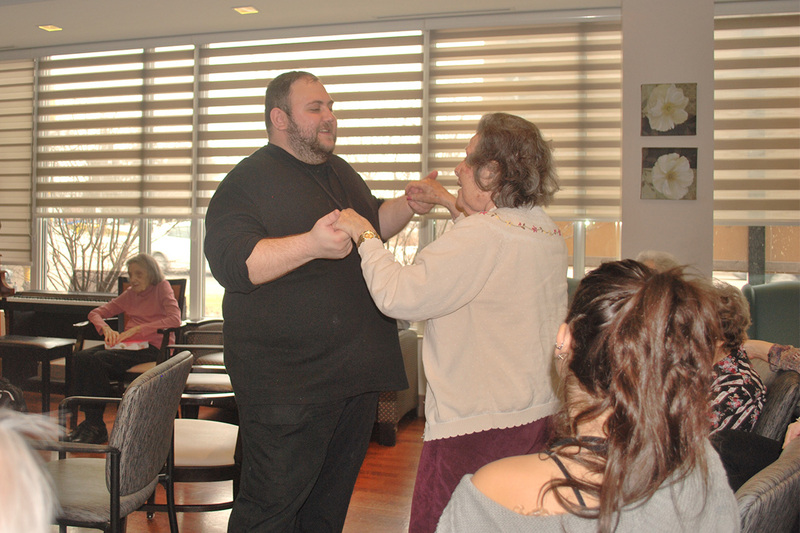 A resident joining in the performance with our talented students at the Family & Friends Brunch. ‘Dancing to the music at our Family & Friends Brunch. 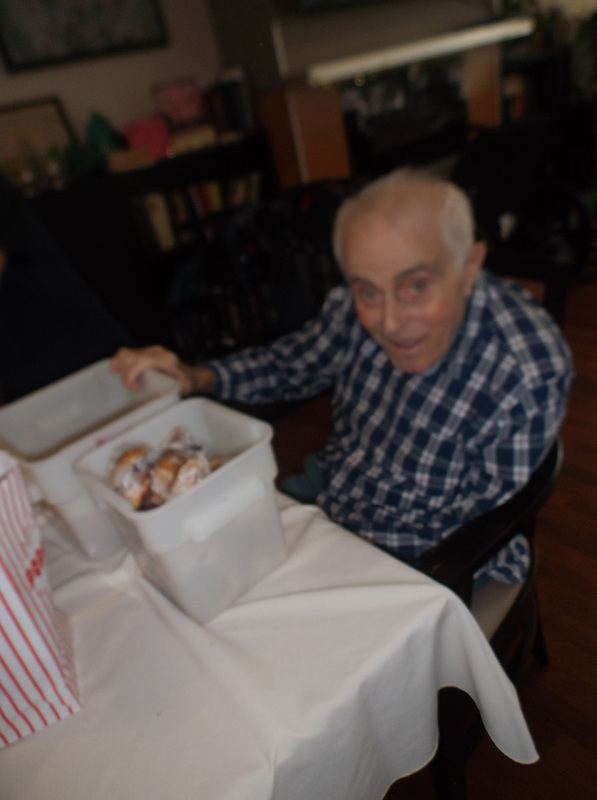 We were busy packing mishloach manot (food baskets) for families and friends! 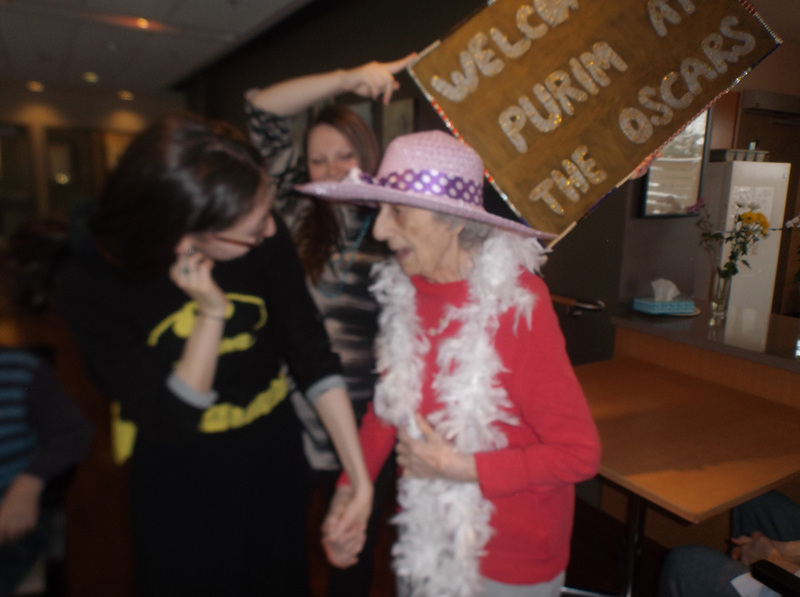 All dressed up and ready for our Purim party! 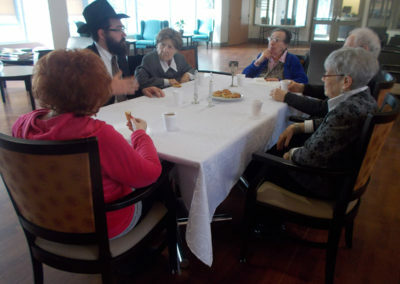 Giving the gift of mishloach manot to family and friends! 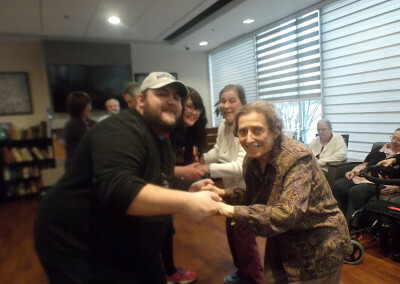 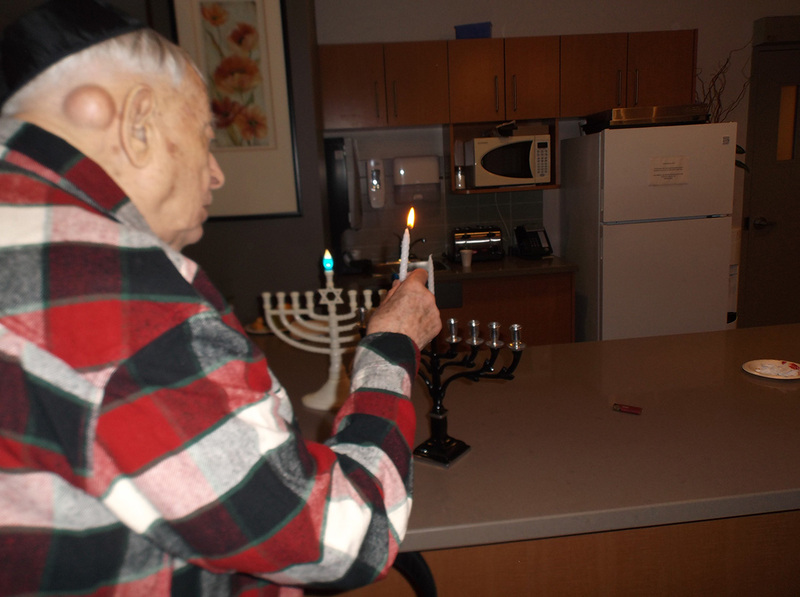 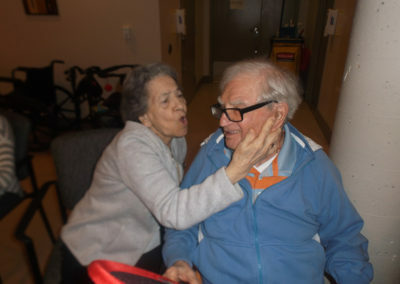 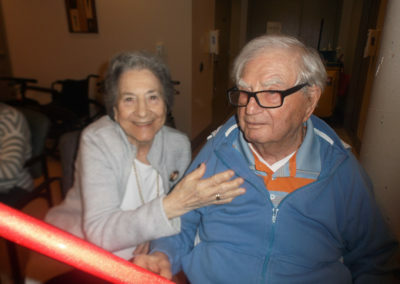 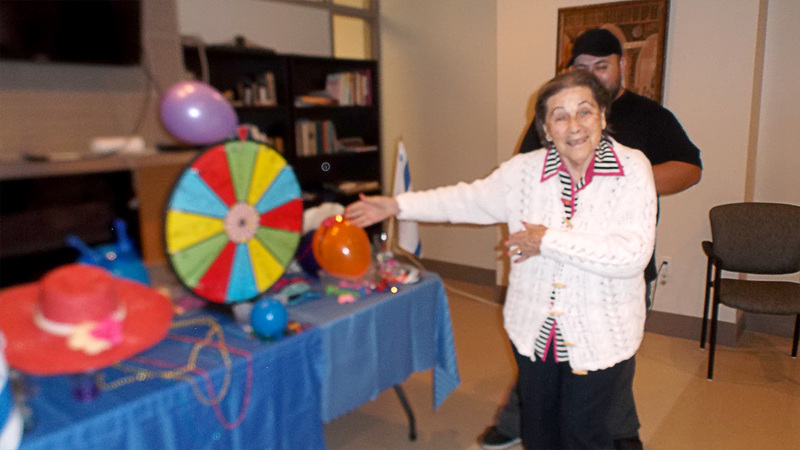 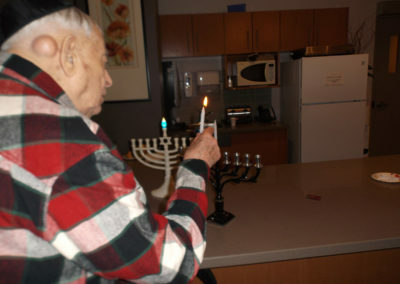 Dancing with our residents at our Channukah Party. 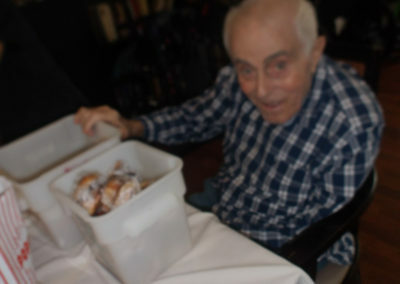 Giving the gift of Mishloach Manot to loved ones. 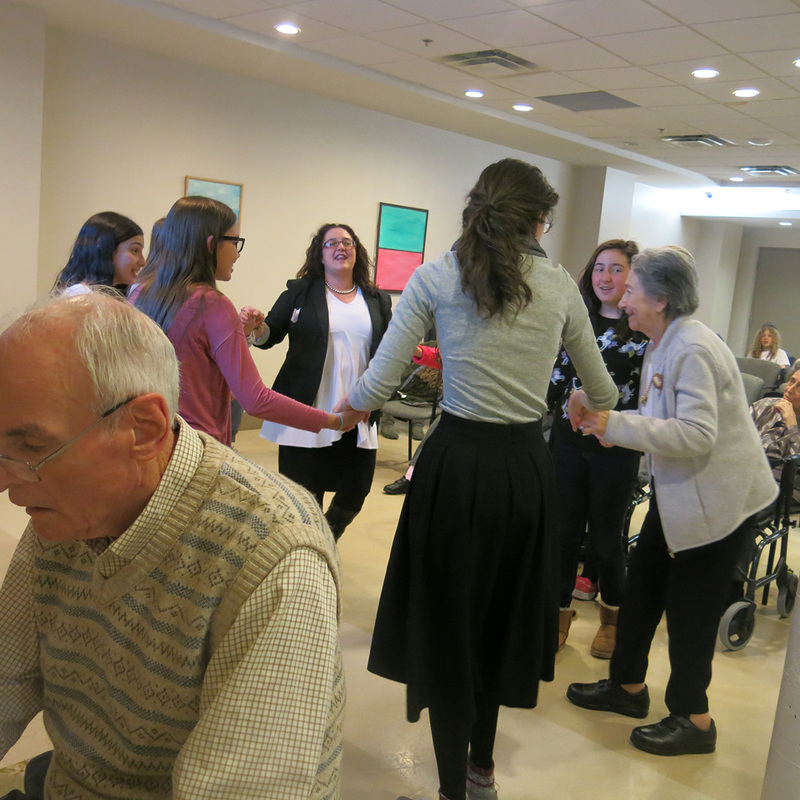 Dancing to music at our Channukah Party. Having a ball at our ‘Purim at the Oscars’ Party! 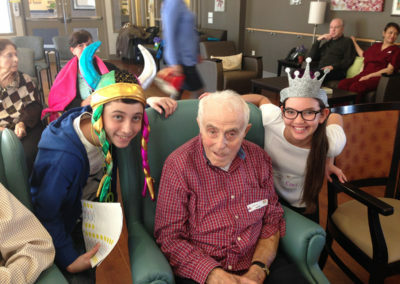 Helping to fill food baskets or ‘Mishloach Manot’ for families and friends for the holiday of Purim! 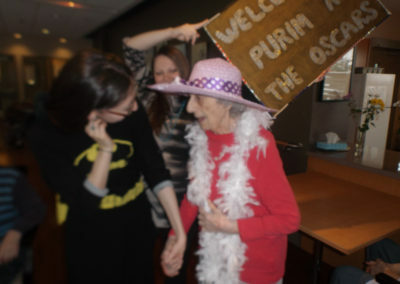 Listening to the megillah reading at our Purim Party. 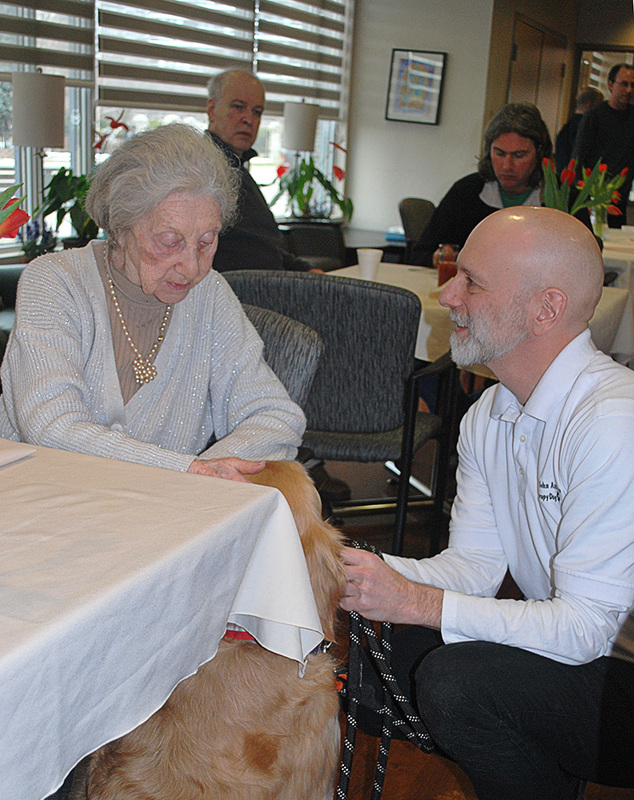 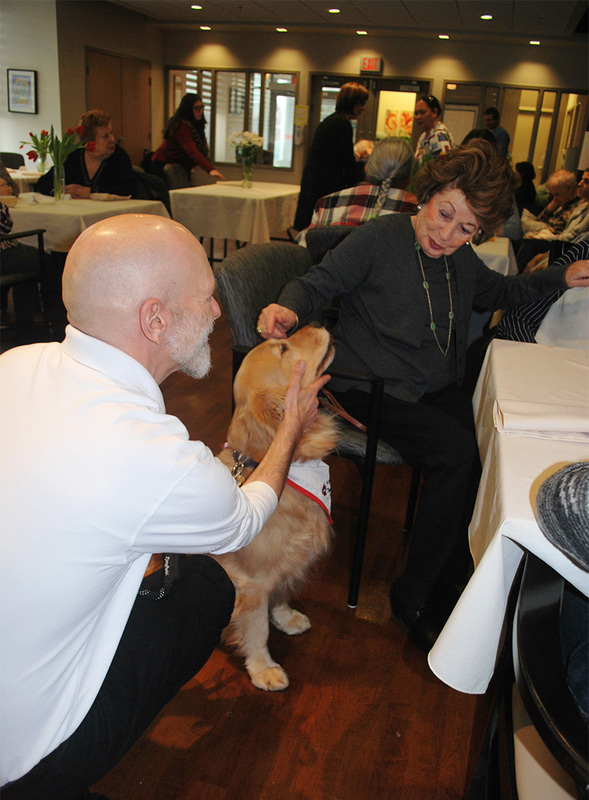 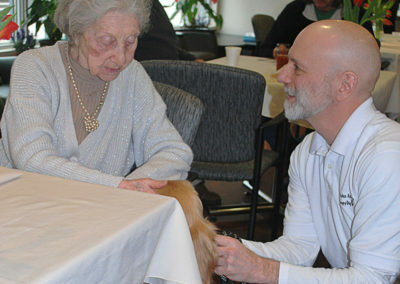 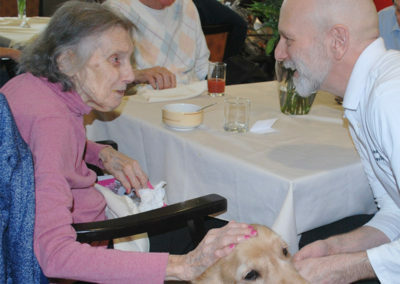 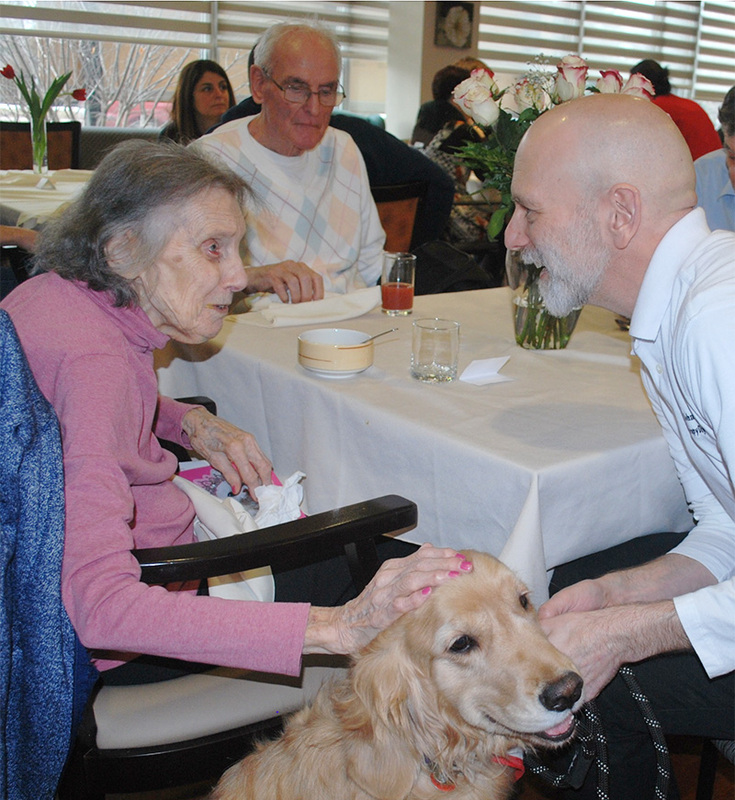 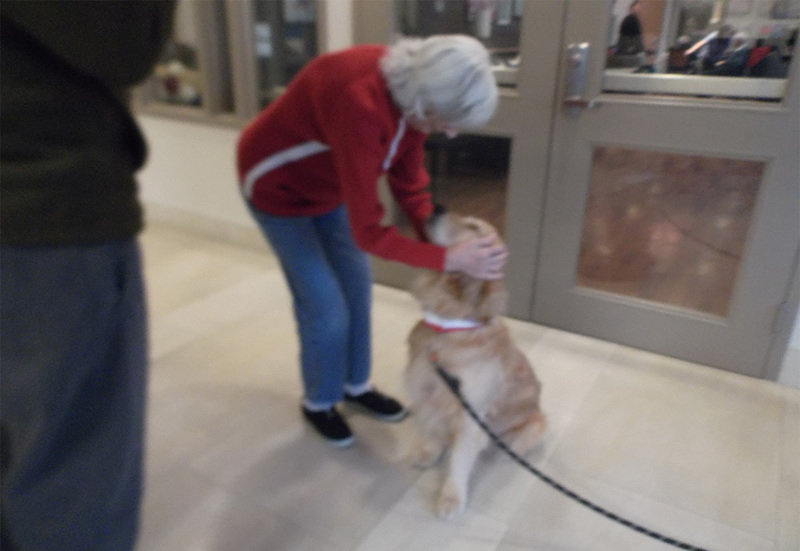 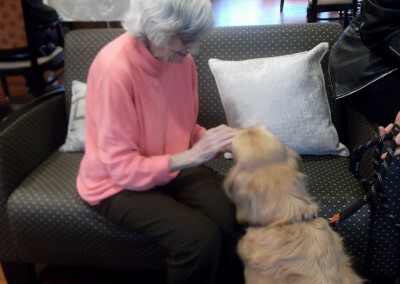 Our residents love our weekly animal therapy visits with Bryan and Piper, an adorable golden retriever. Enjoying spending time with this adorable puppy! 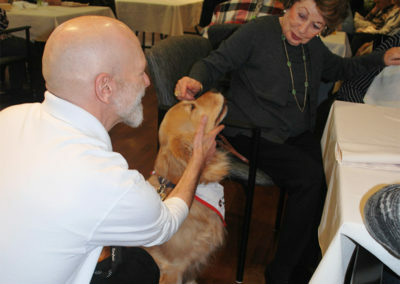 Enjoying spending time with our animal therapy team, Bryan and Piper, a Golden Retriever Puppy. 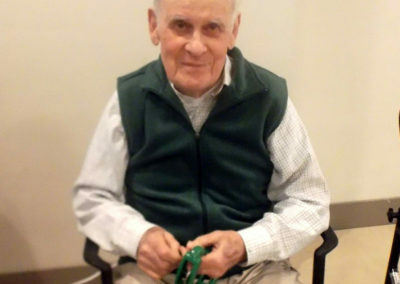 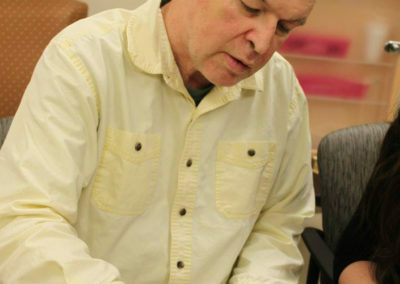 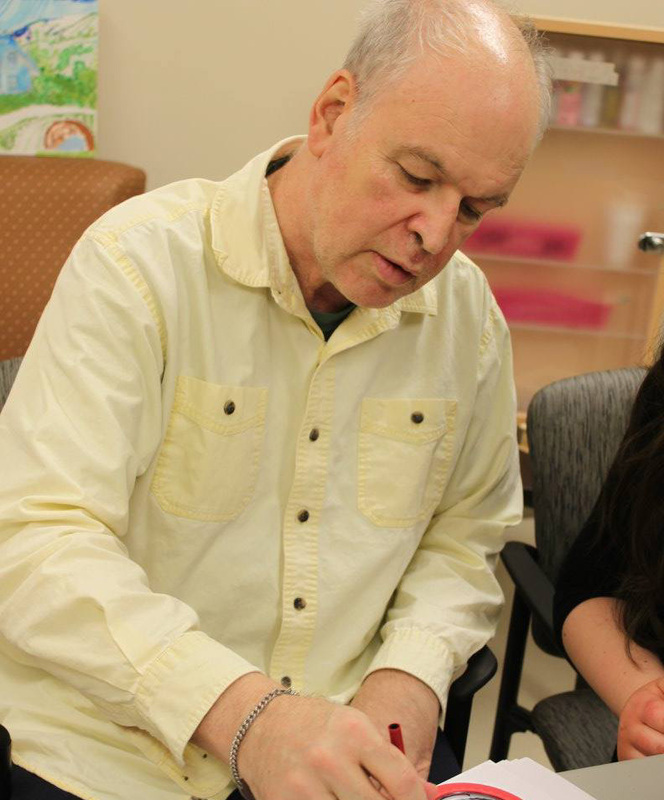 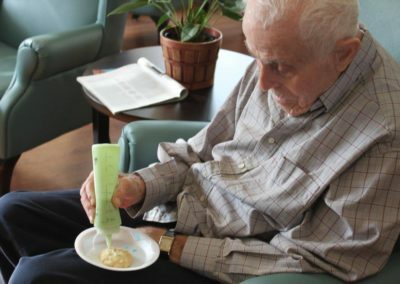 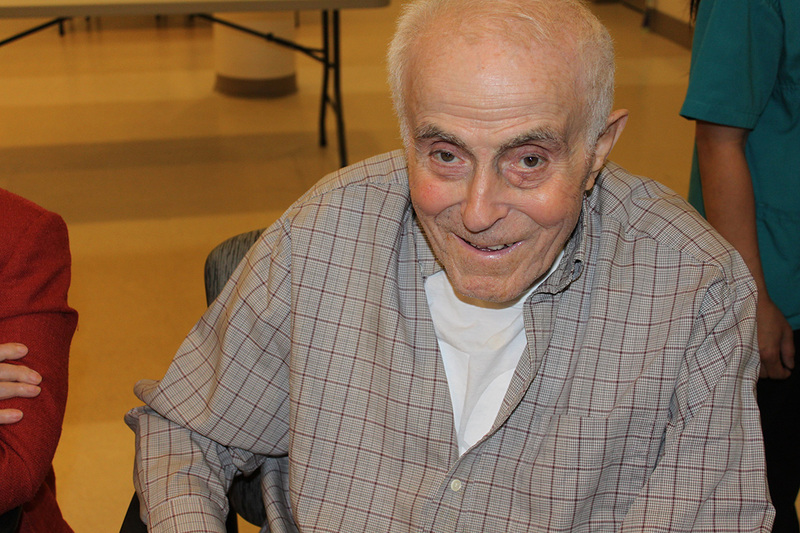 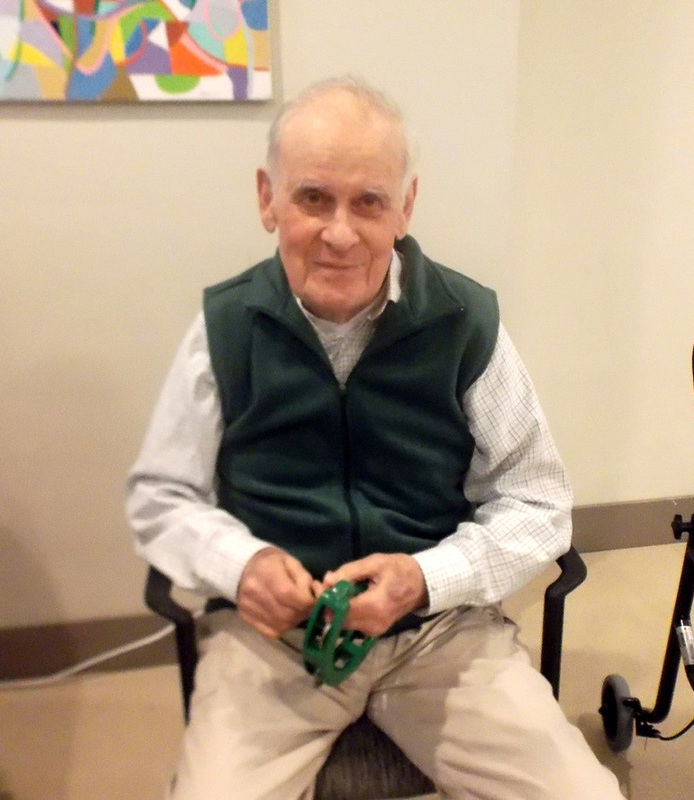 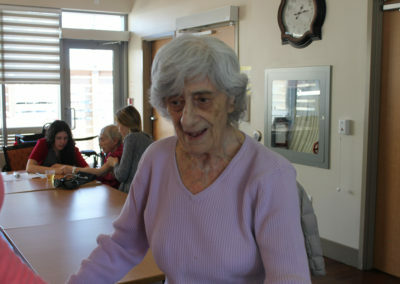 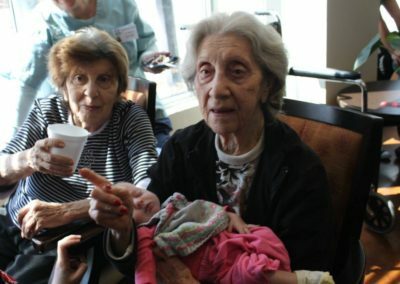 One Of Our Residents Playing The Tambourine During Our Music Program. 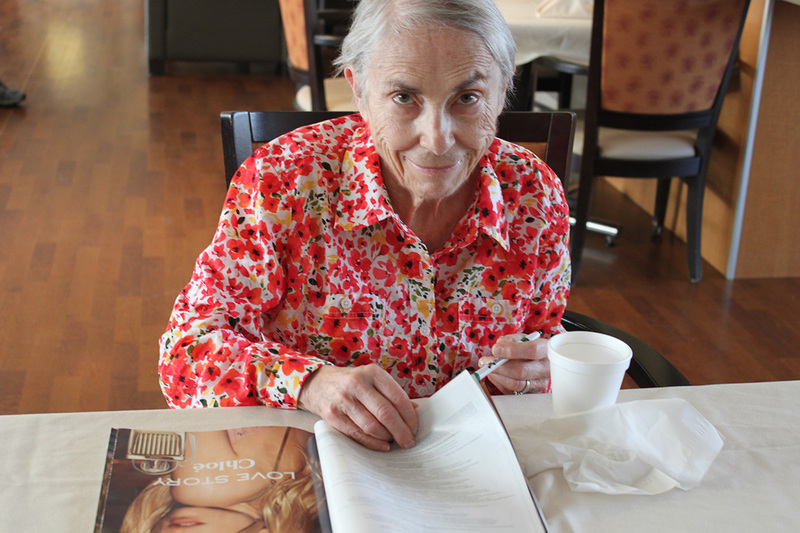 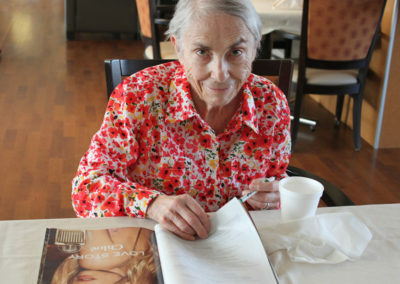 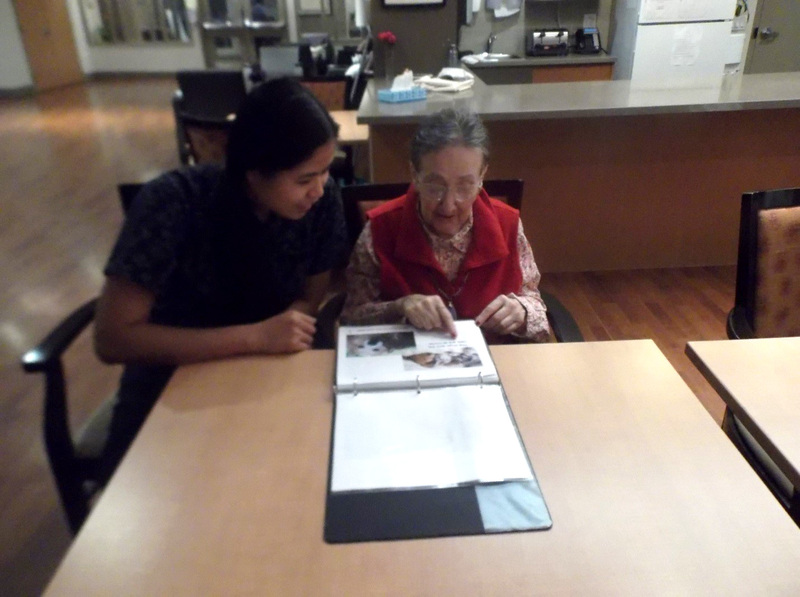 One of our residents reading our “Through the Seasons” book made by programs staff and students. 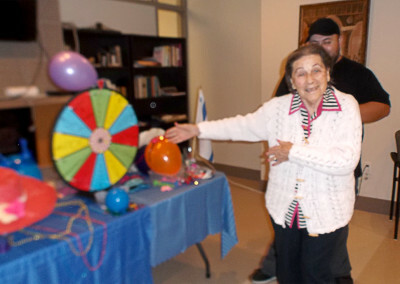 Our Wheel of Destiny game is so much fun! 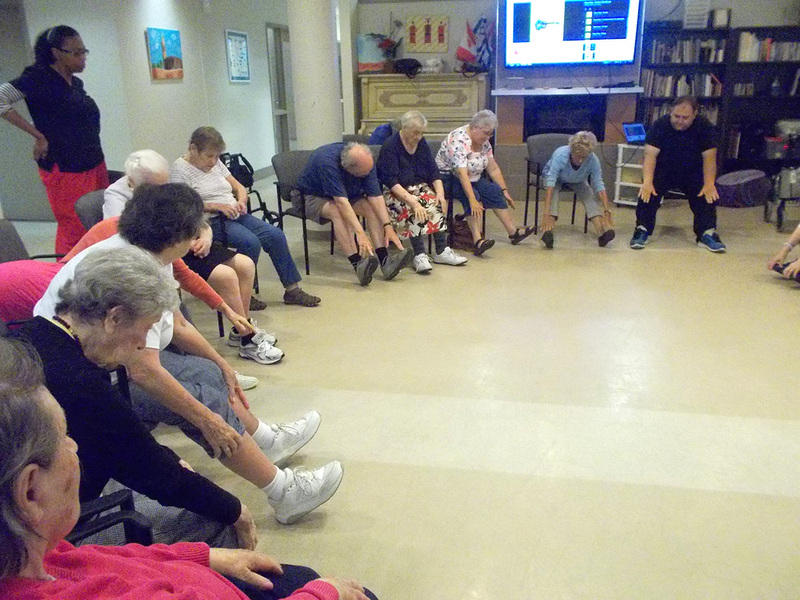 Young adults from the META Centre join us every Monday for a singalong and to help out with our exercises. Putting on tefillin during our weekly Friday visits with Rabbi Dov Marshall from Jewish Seniors Circle. 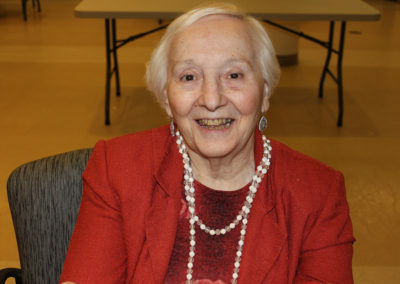 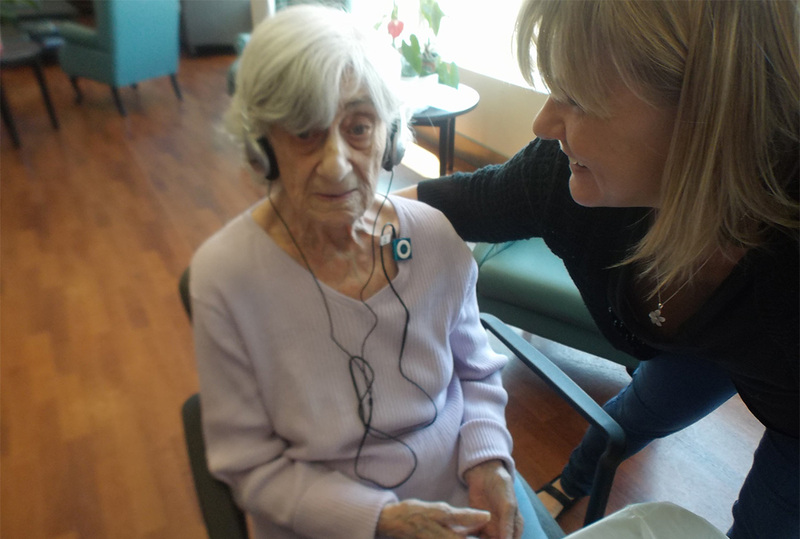 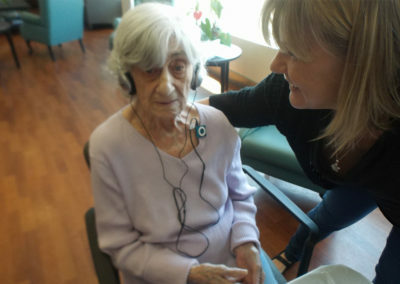 Listening to music on her very own iPod donated by the Alzheimer Society of Toronto’s Music Project. 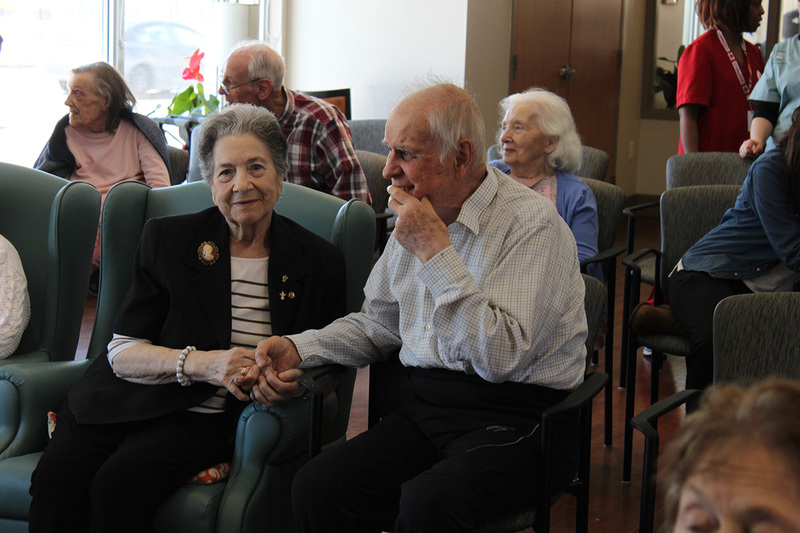 Reading the award received during our One Kenton Place awards ceremony. 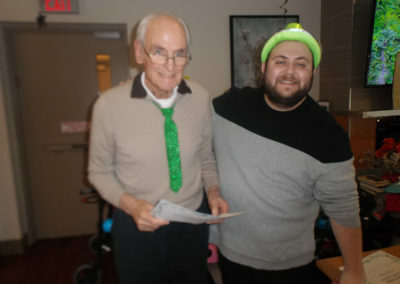 Collecting the award during our awards ceremony. 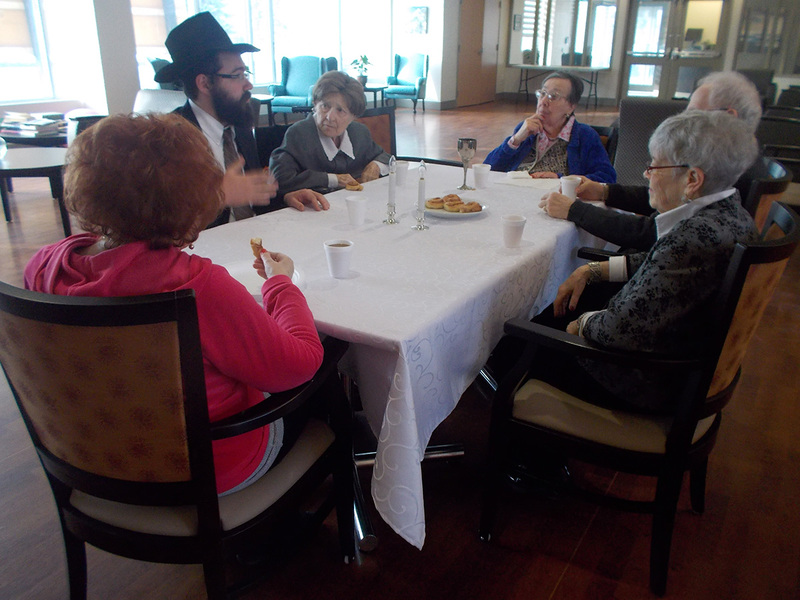 Our residents engaging in conversation with Rabbi Marshall, who visits every Friday for our Shabbat Program. 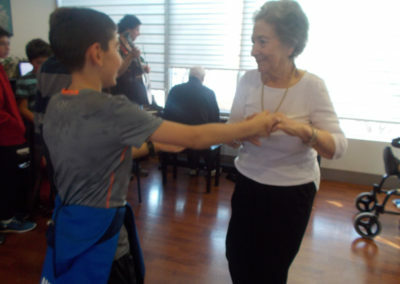 Dancing to music from our programs. 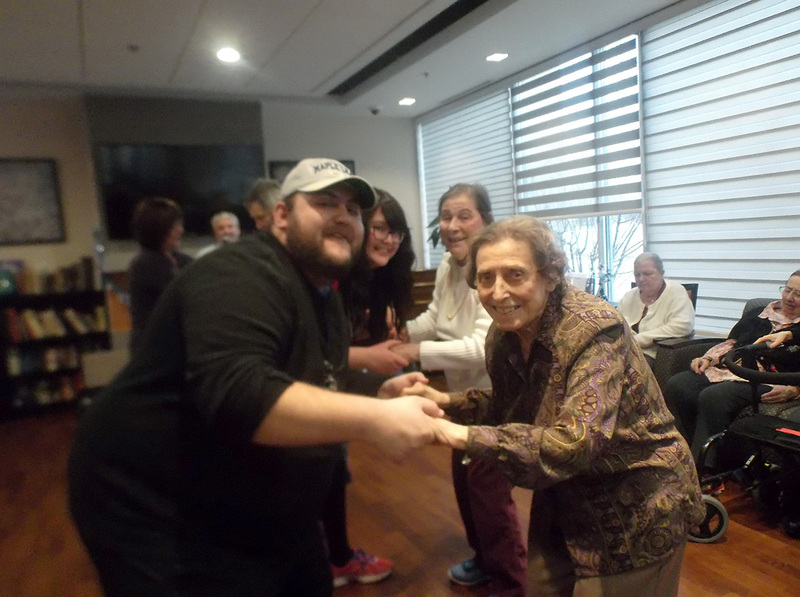 Smiling for the camera during our morning exercise program. 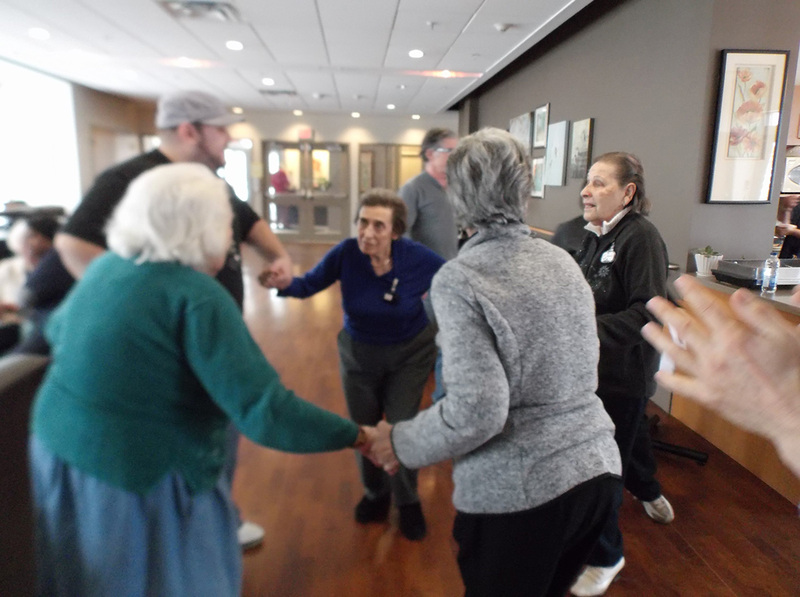 Having a good time during our morning exercise program. 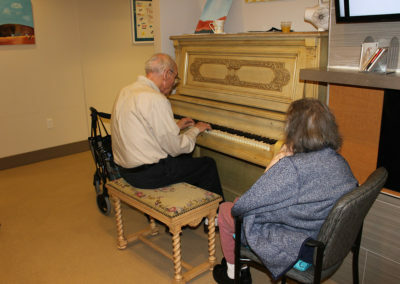 Enjoying listening to music from our resident piano player! 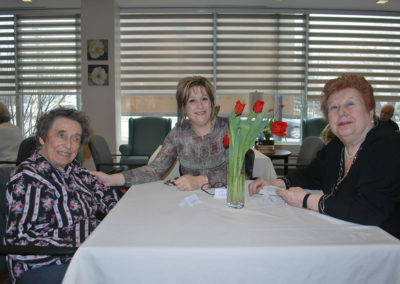 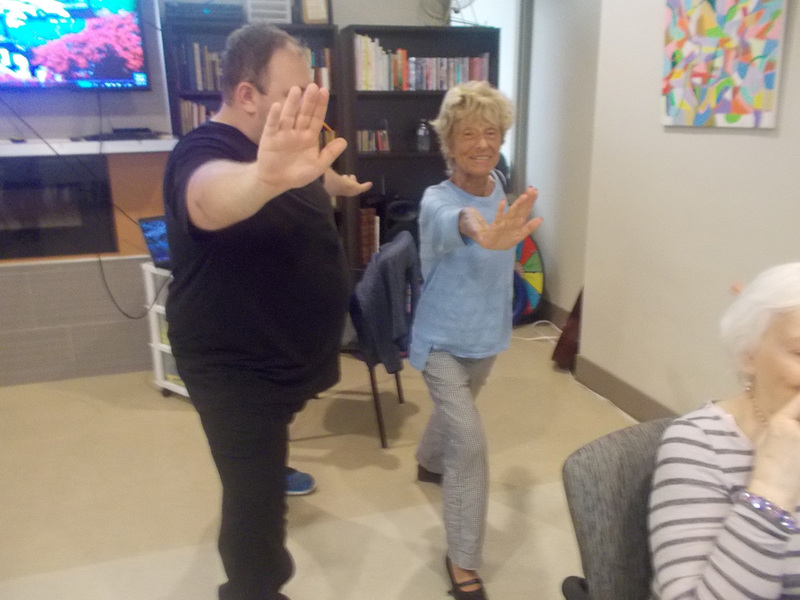 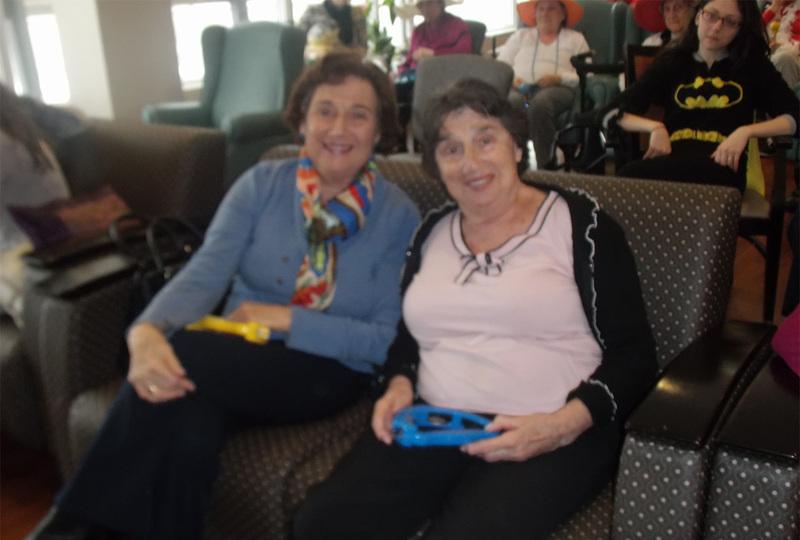 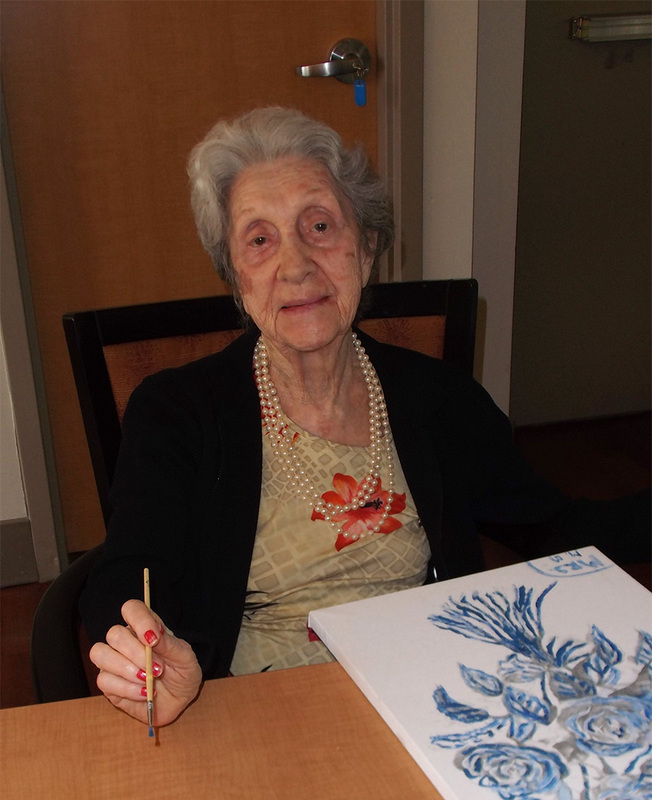 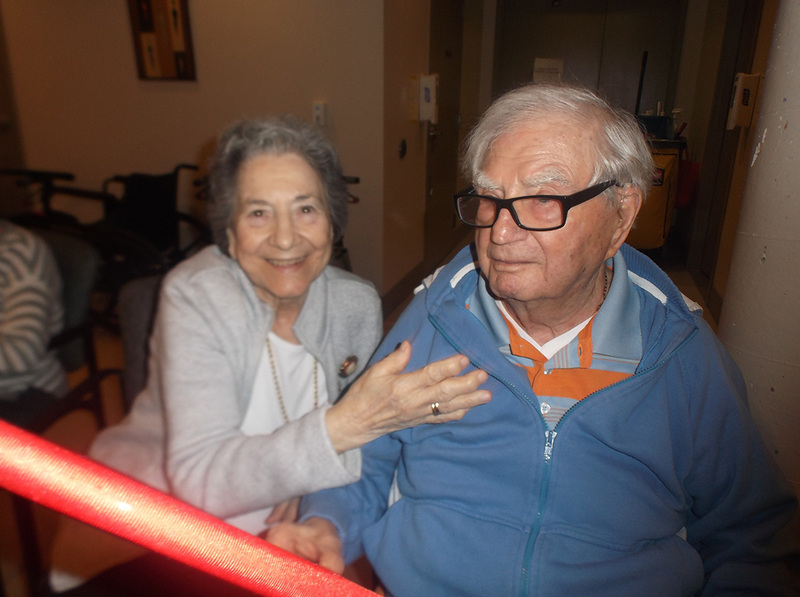 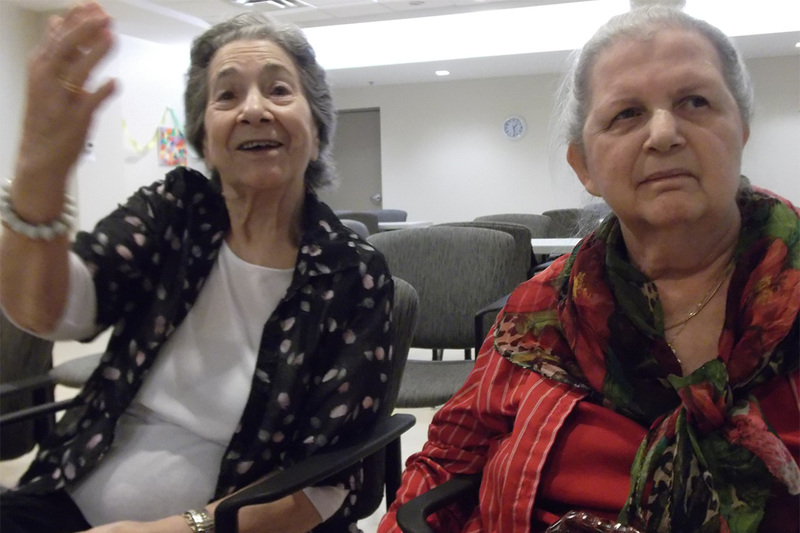 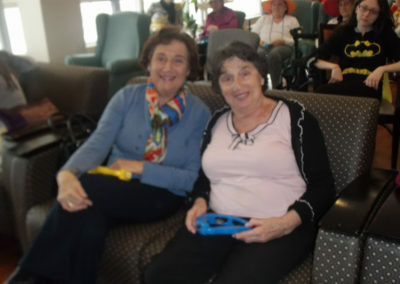 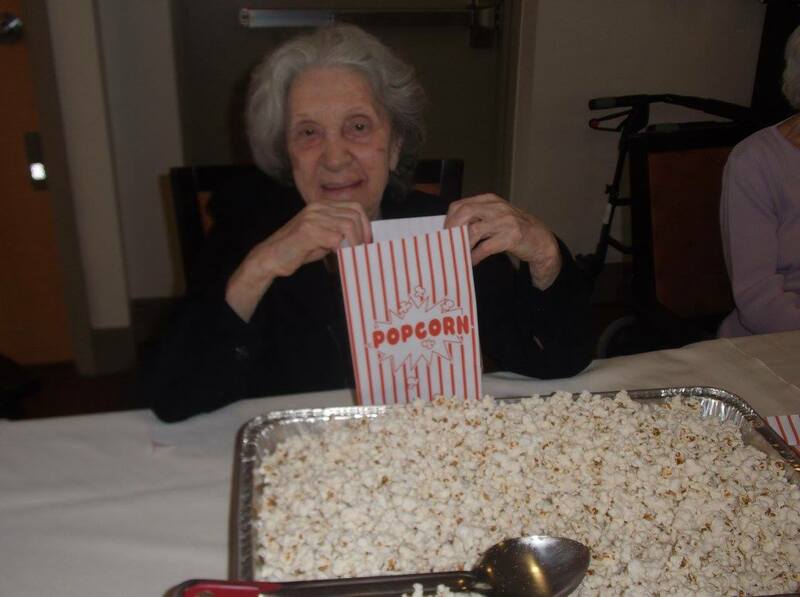 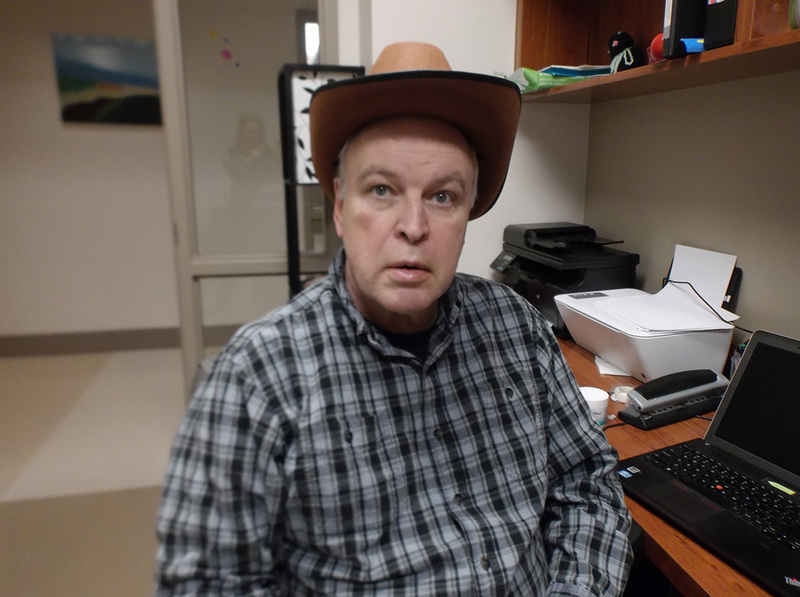 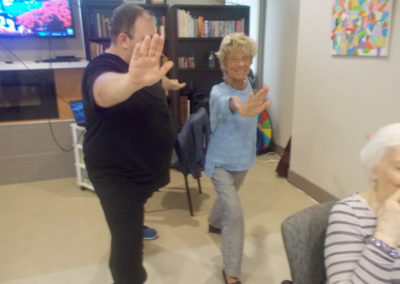 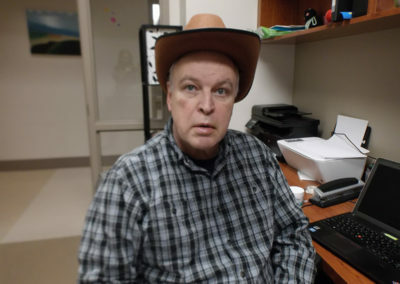 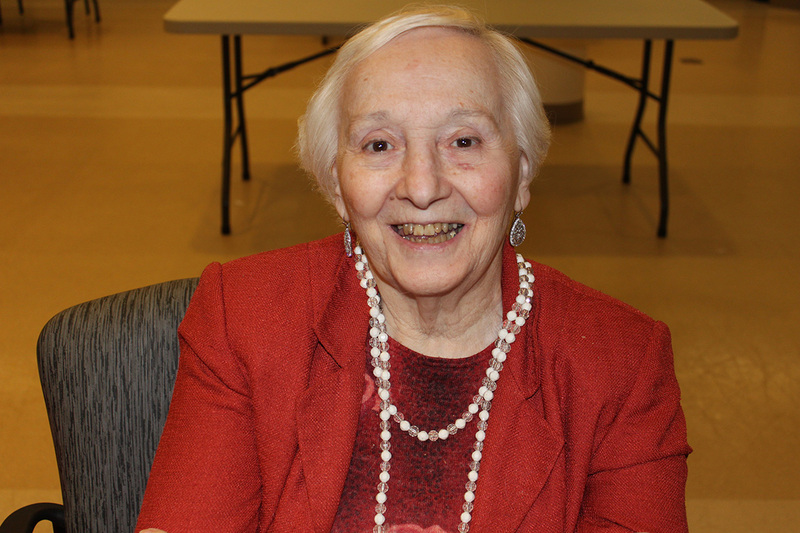 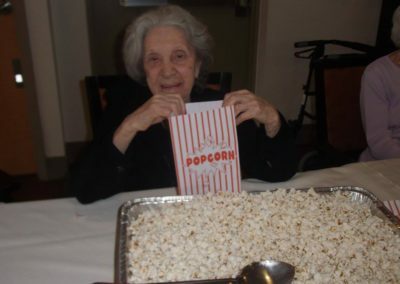 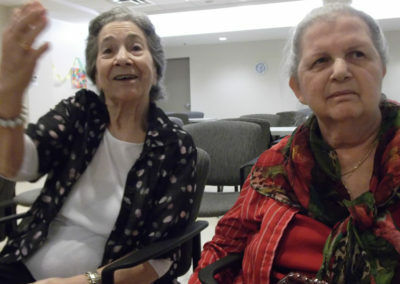 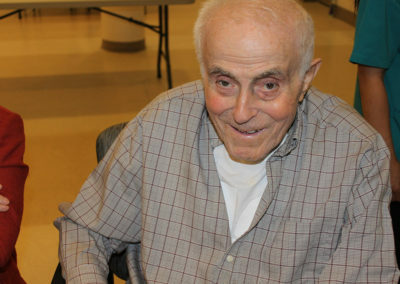 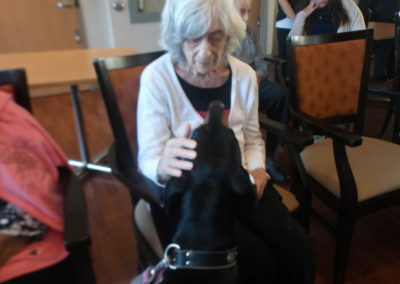 Our residents enjoying our programs! 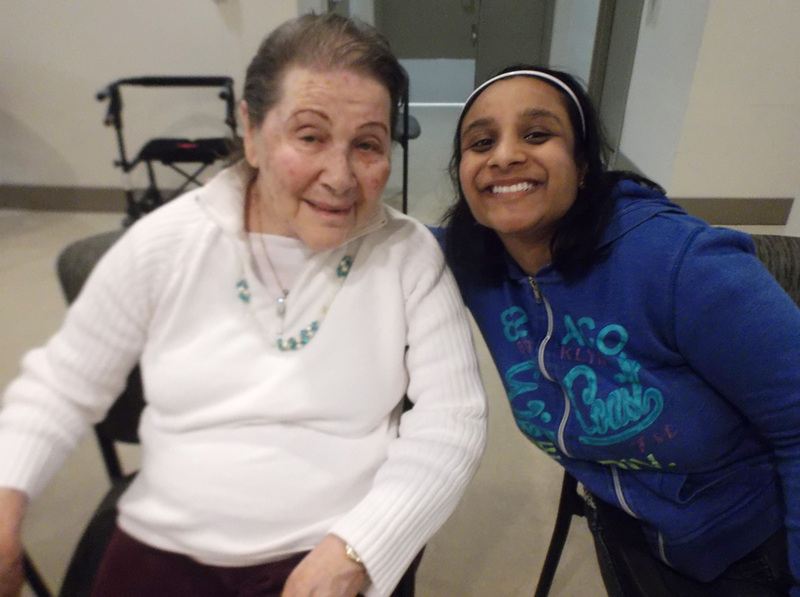 Posing for the camera with one of our Social Work students, Rikki. 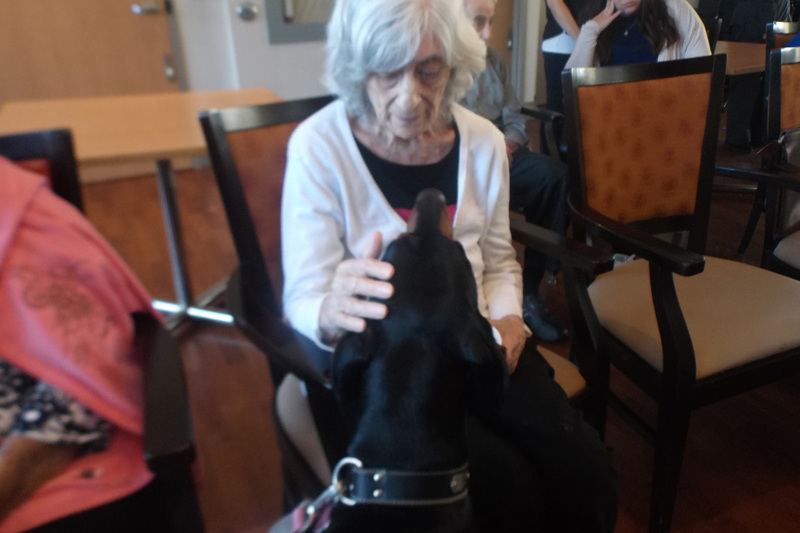 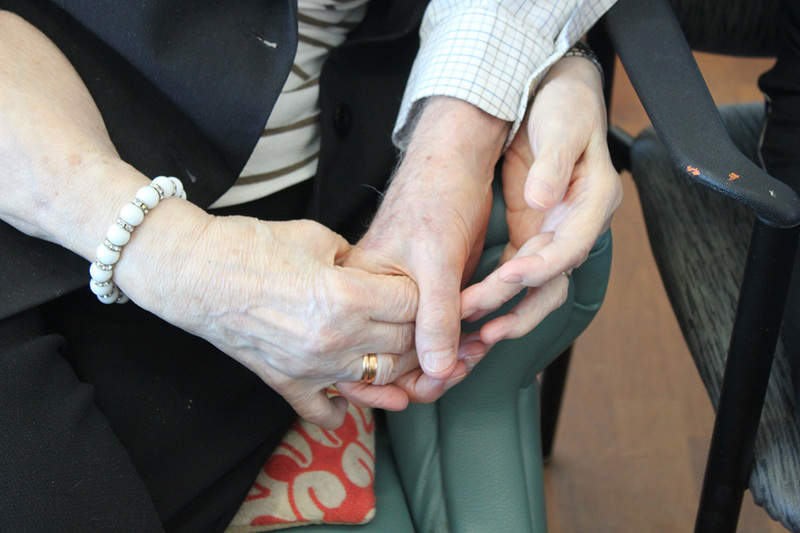 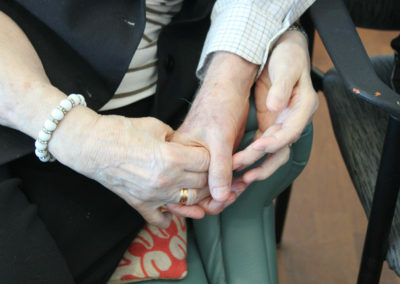 Beautiful symbol of friendship between our residents. Our residents socializing during our programs. 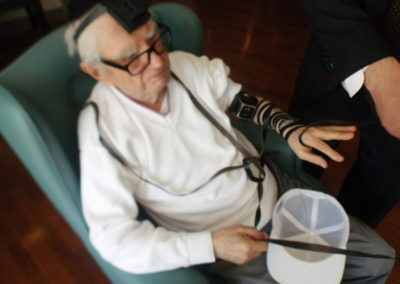 Keeping up to date on the latest fashion trends. 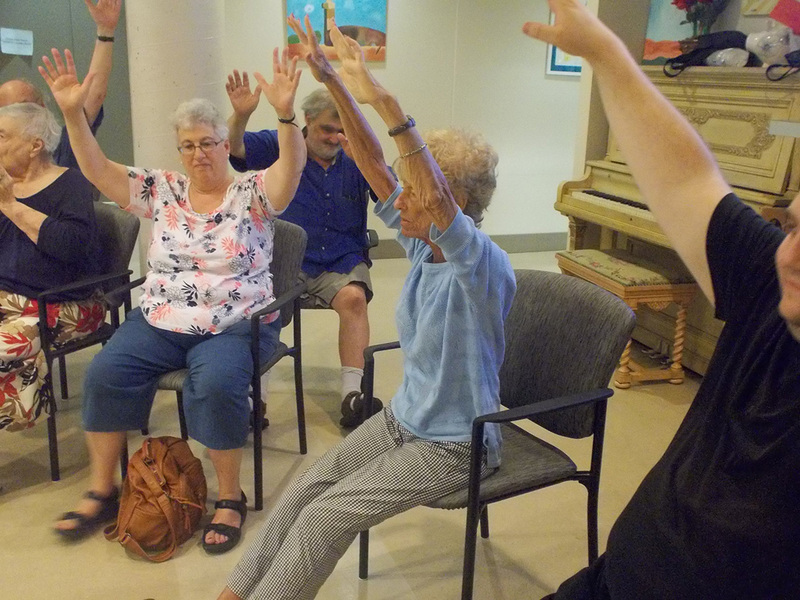 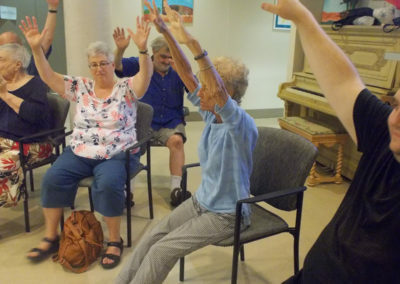 Enjoying a yoga and wellness class given by one of our residents.